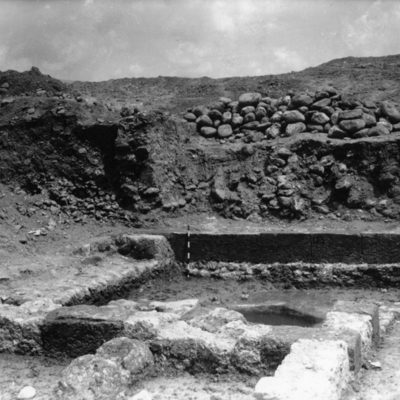 General view of the pool. 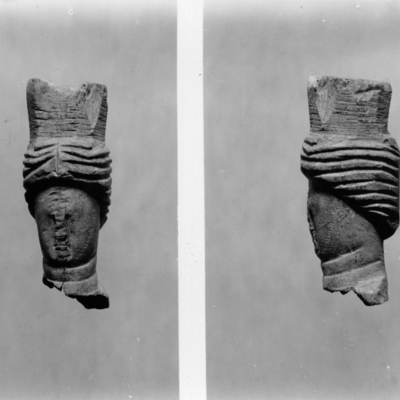 Pipe (object no. 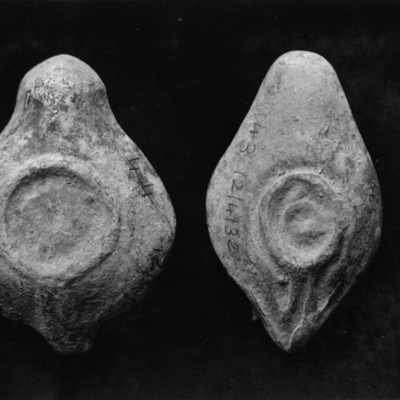 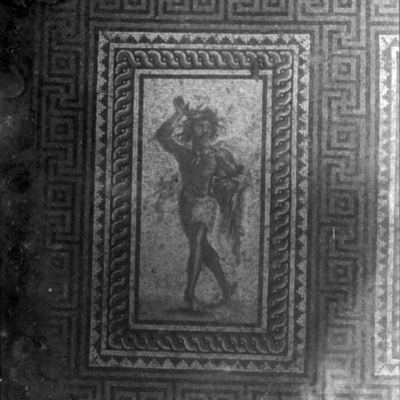 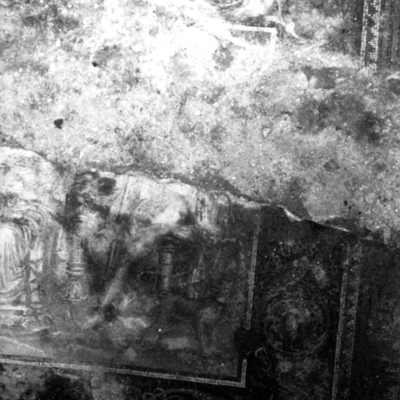 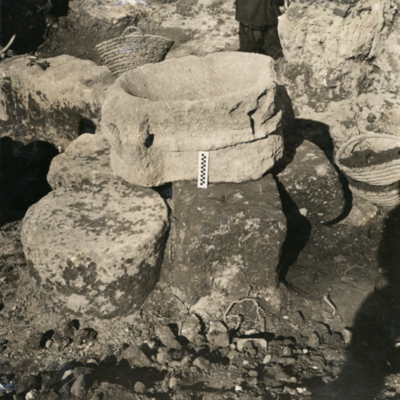 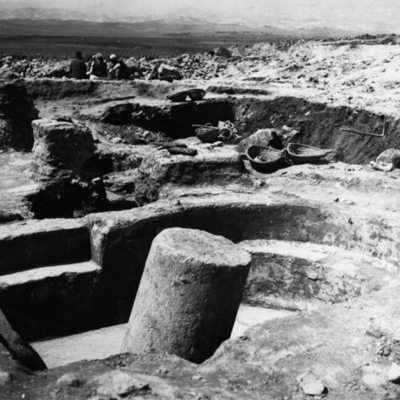 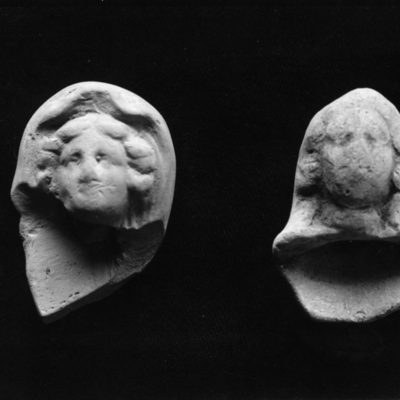 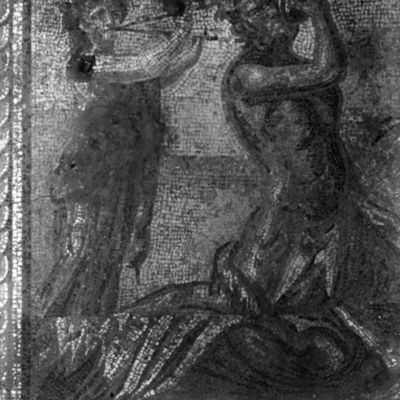 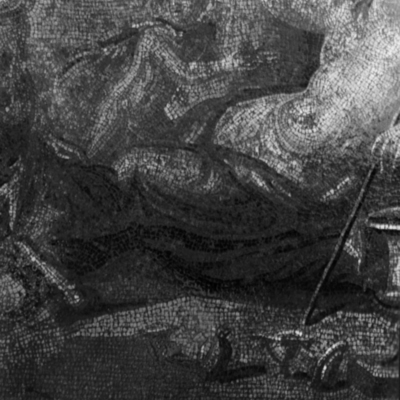 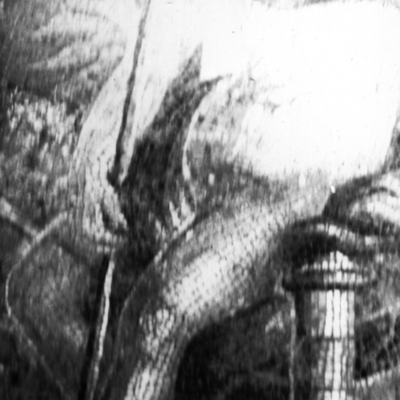 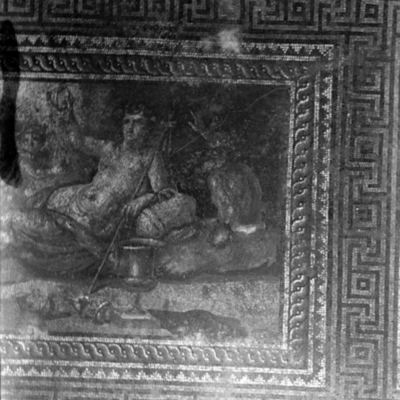 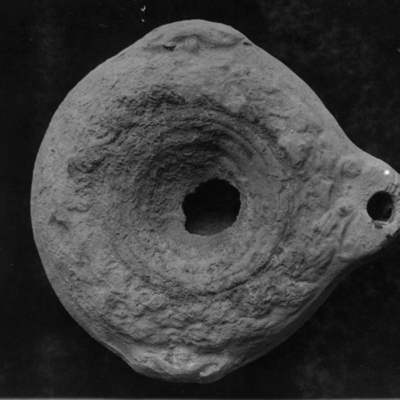 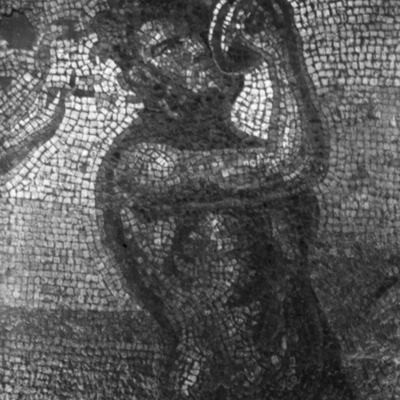 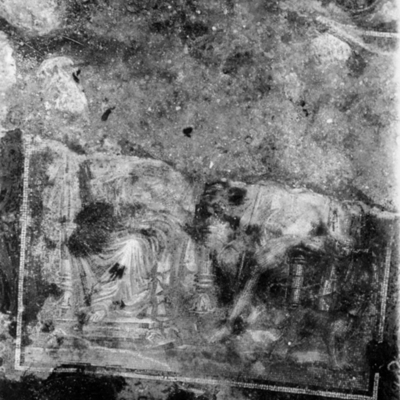 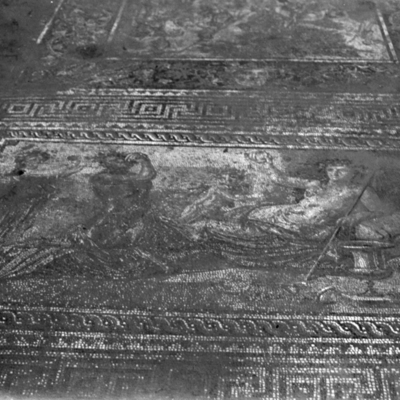 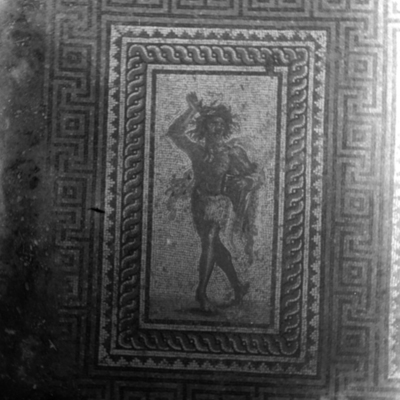 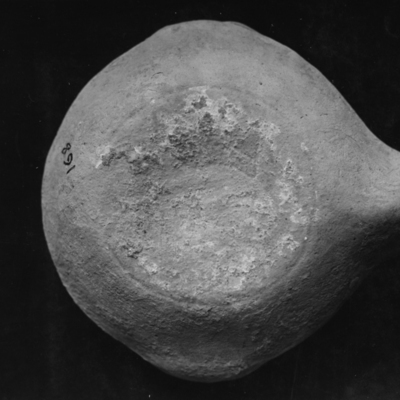 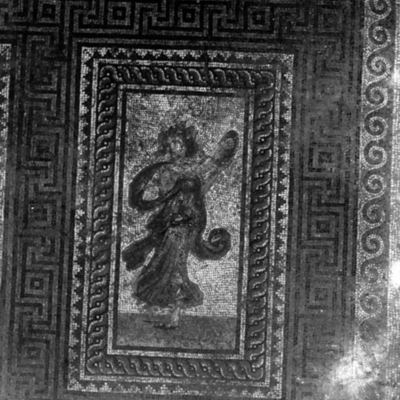 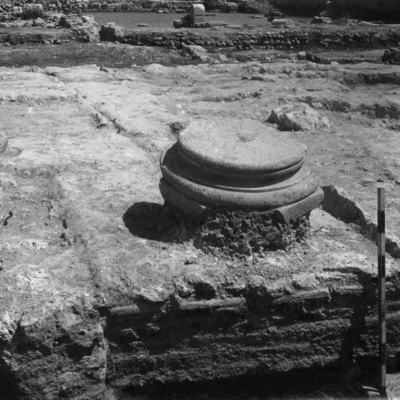 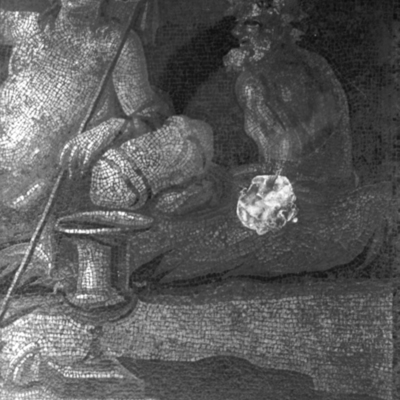 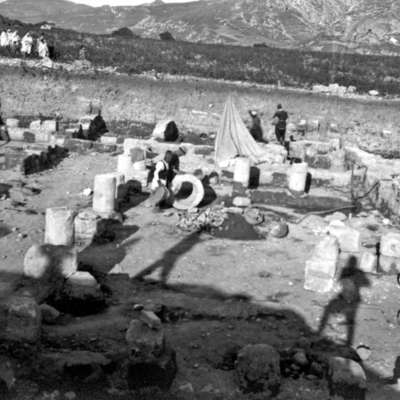 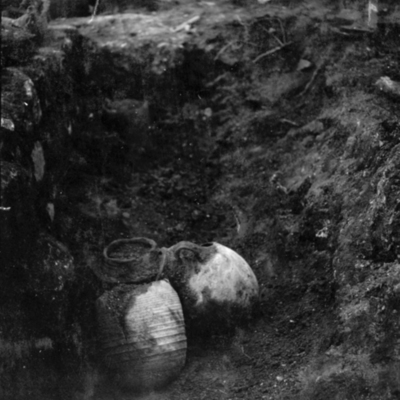 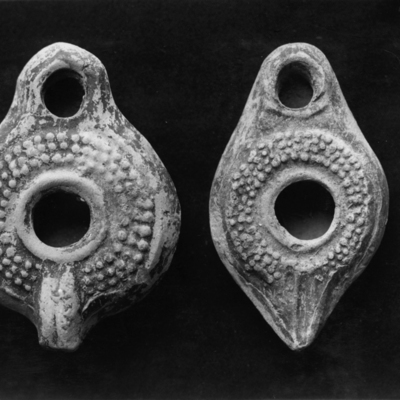 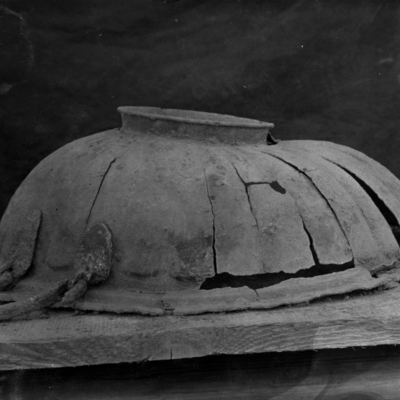 201) and amphora (object no. 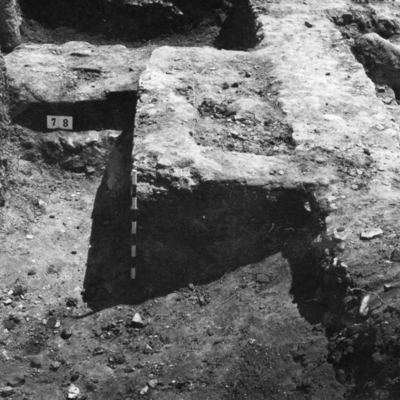 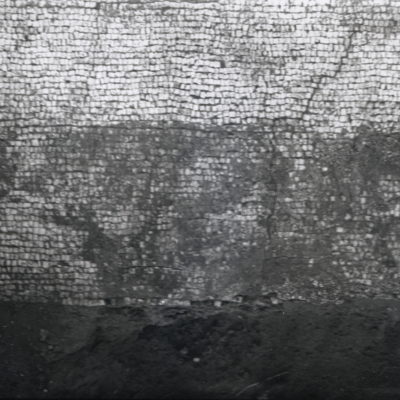 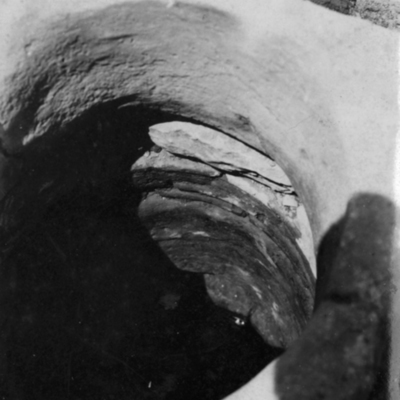 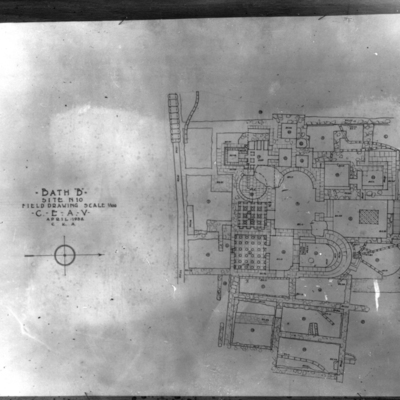 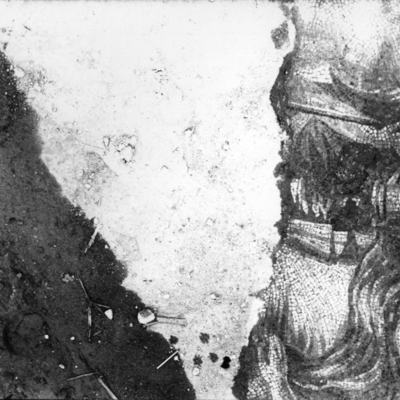 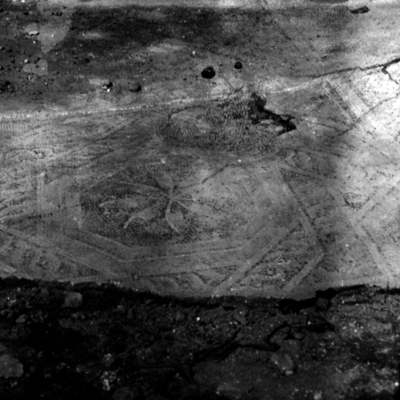 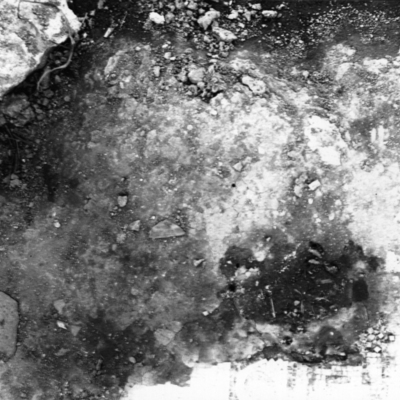 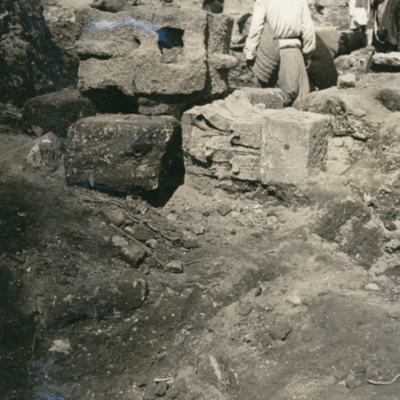 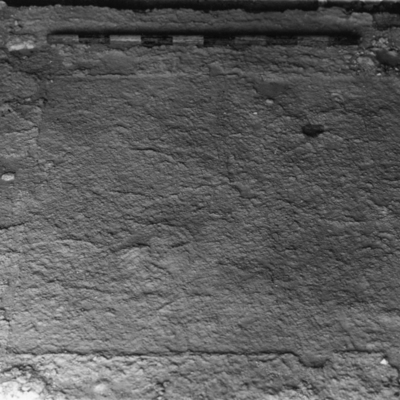 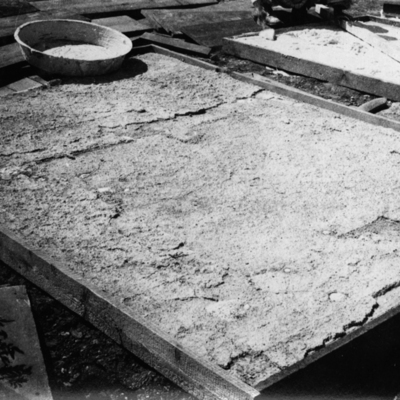 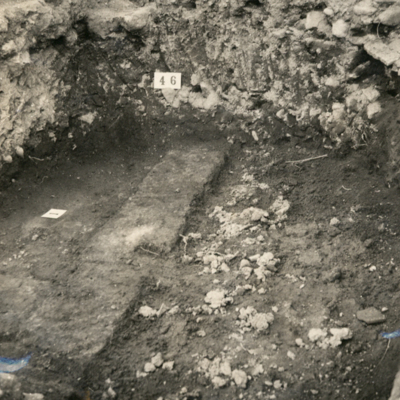 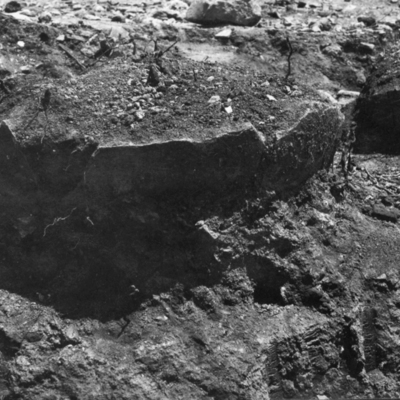 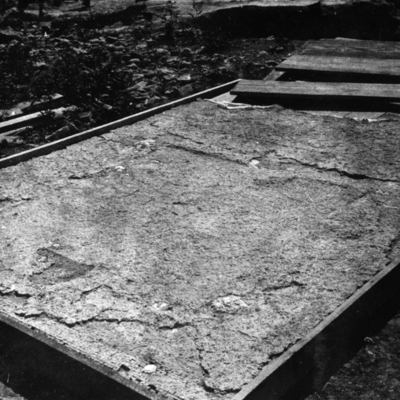 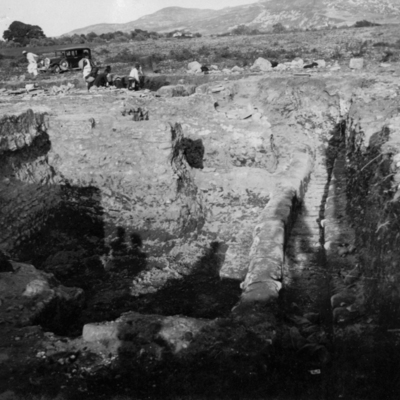 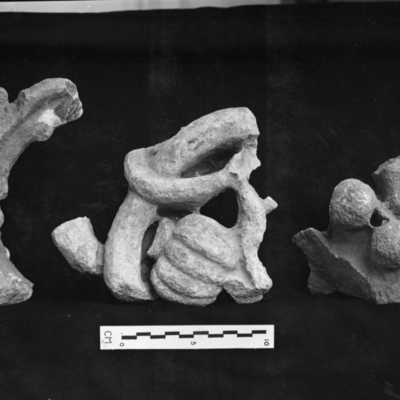 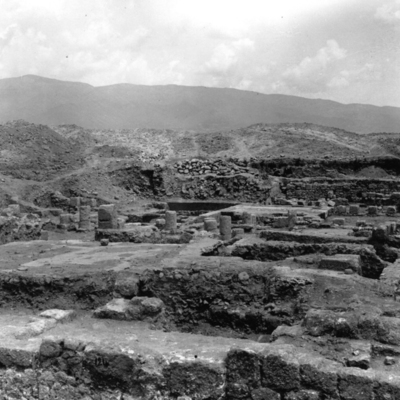 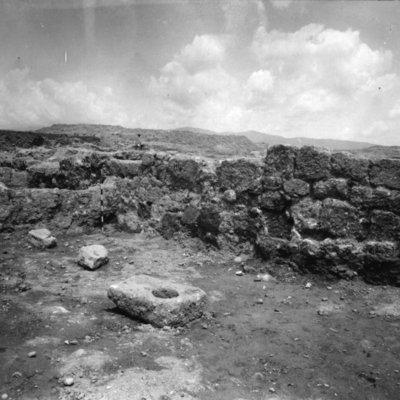 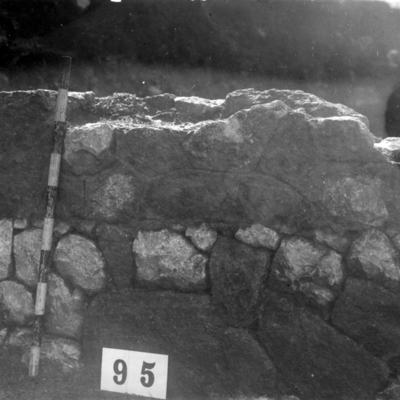 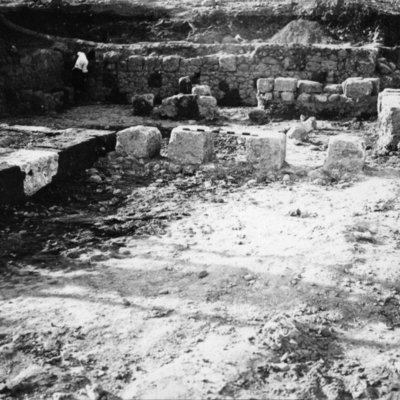 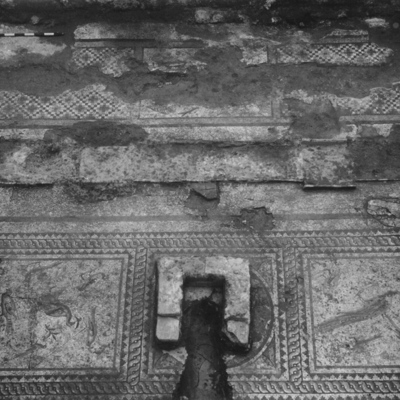 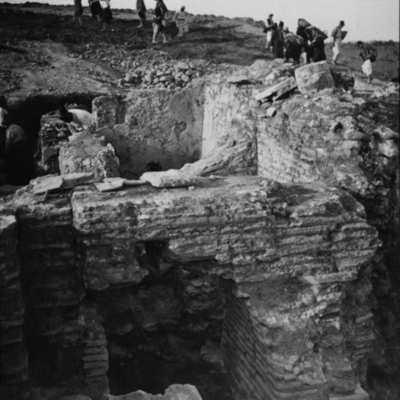 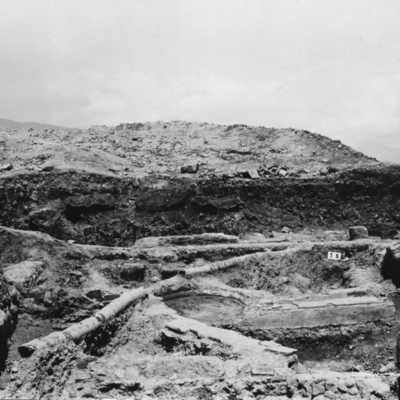 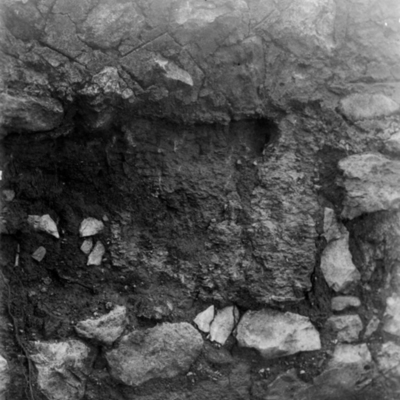 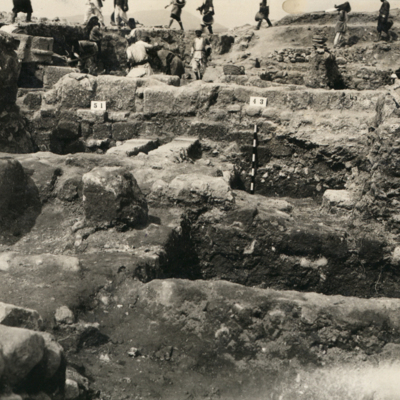 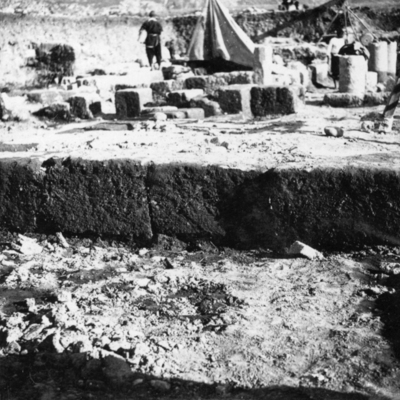 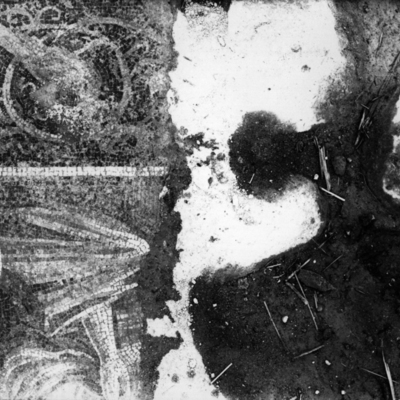 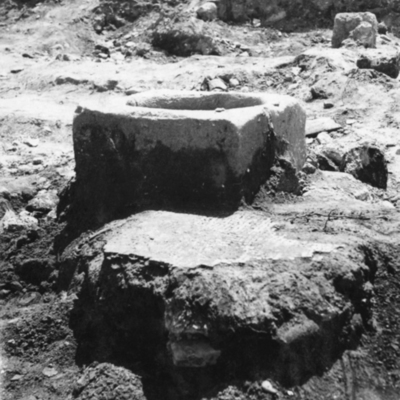 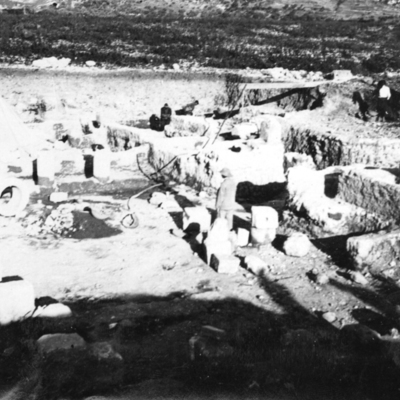 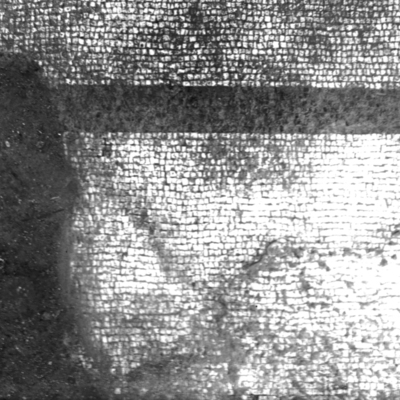 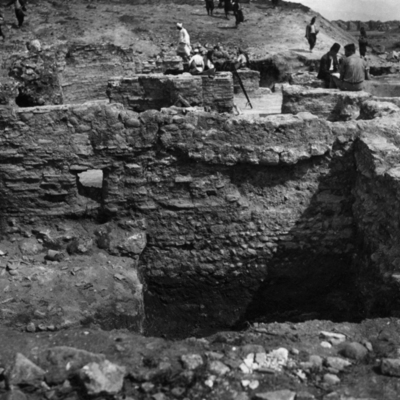 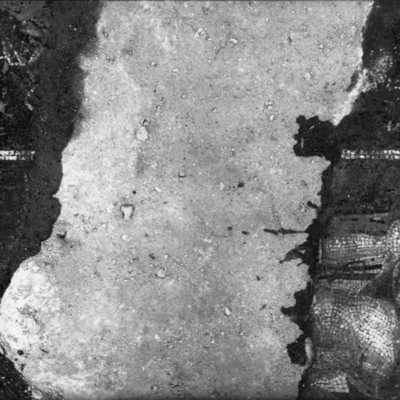 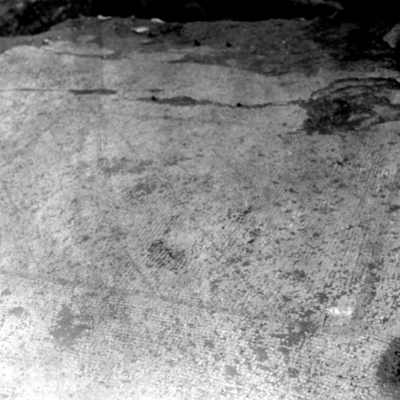 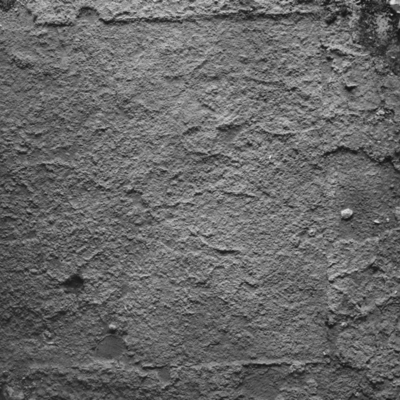 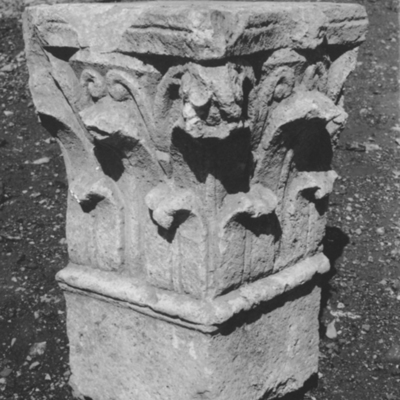 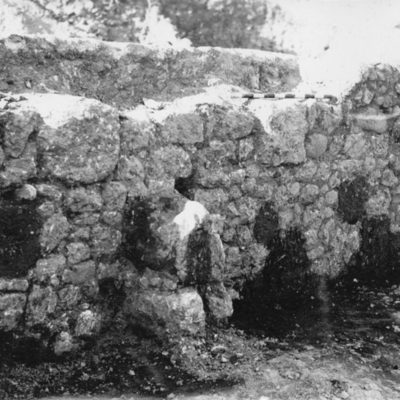 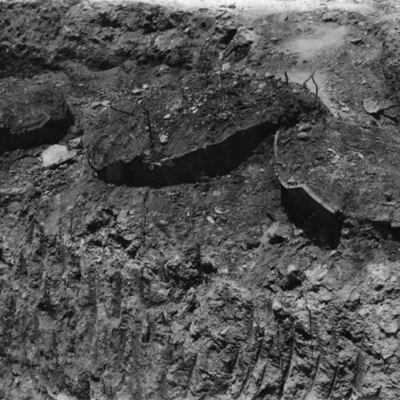 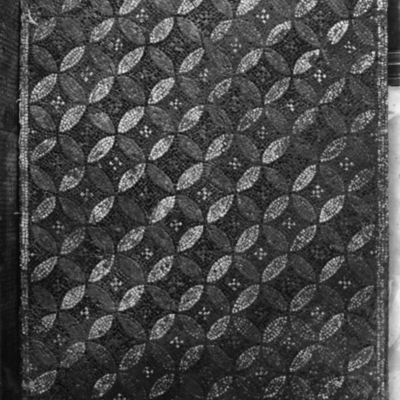 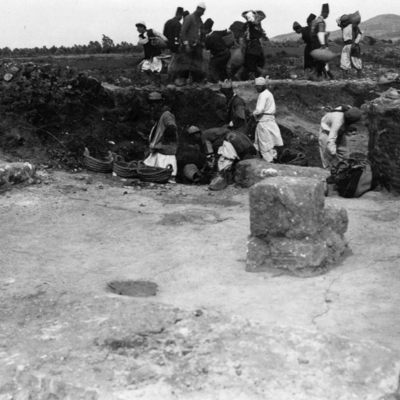 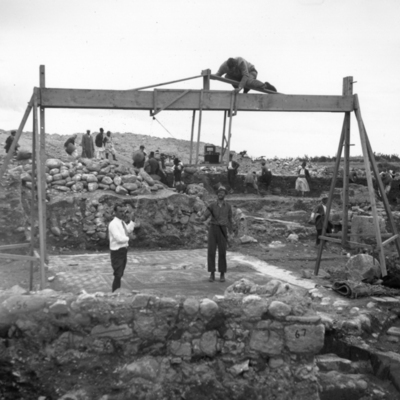 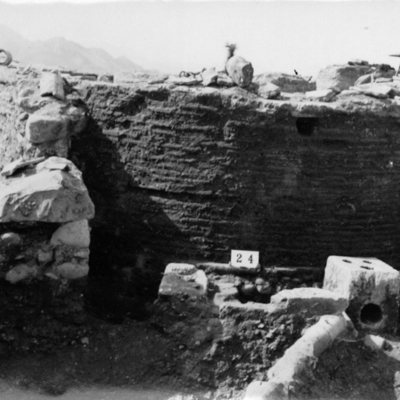 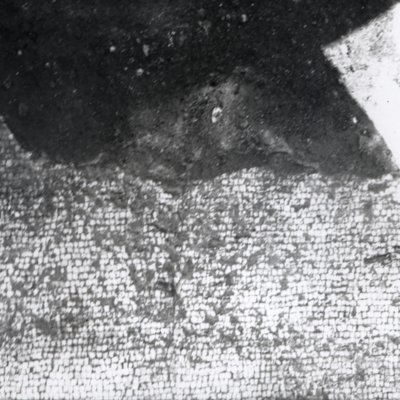 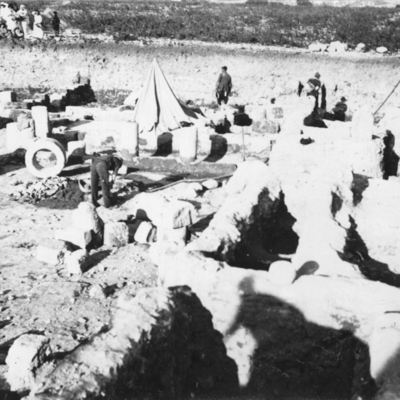 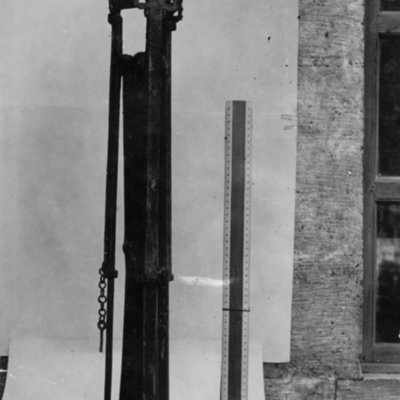 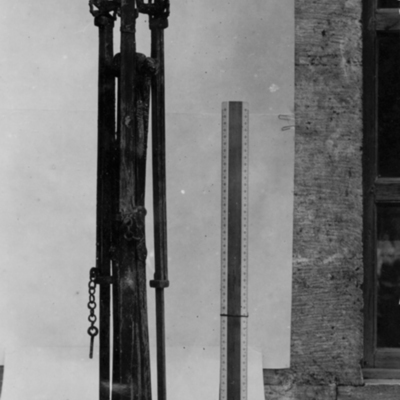 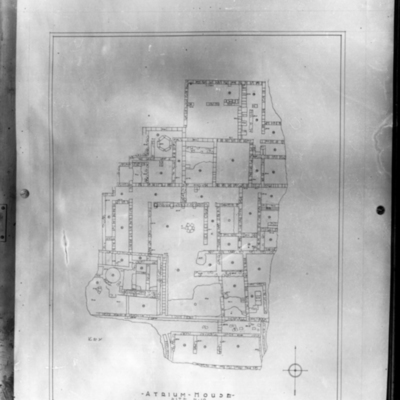 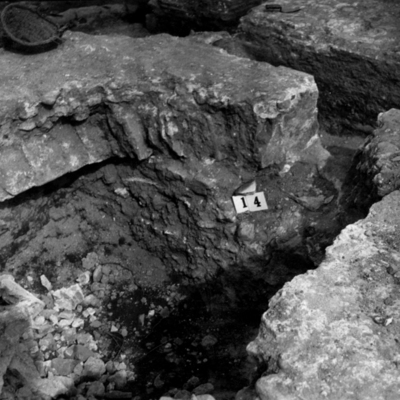 195) in situ. 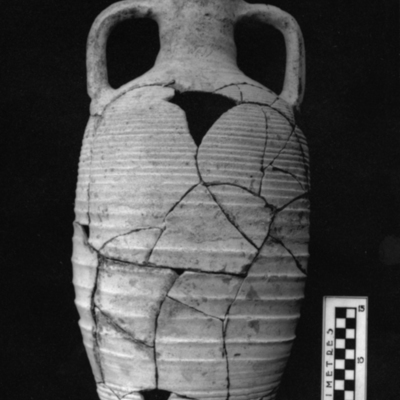 Large amphora (object no. 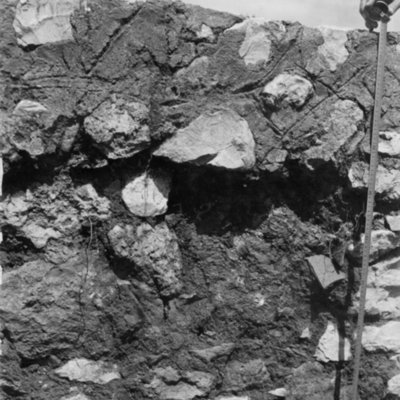 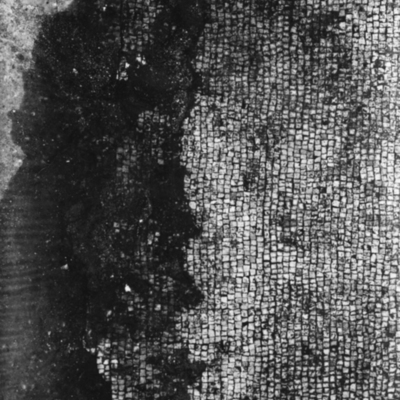 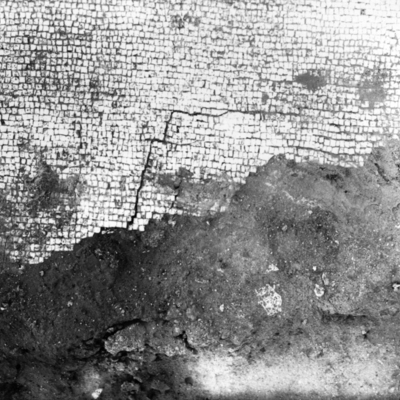 255) in situ. 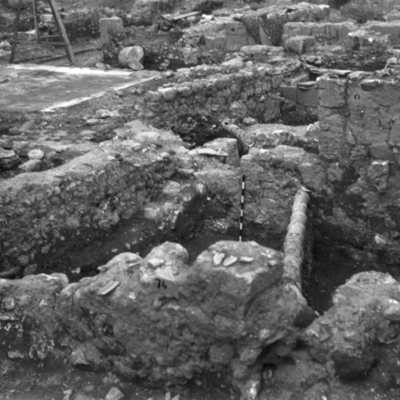 View of Room 19 looking into Room 16. 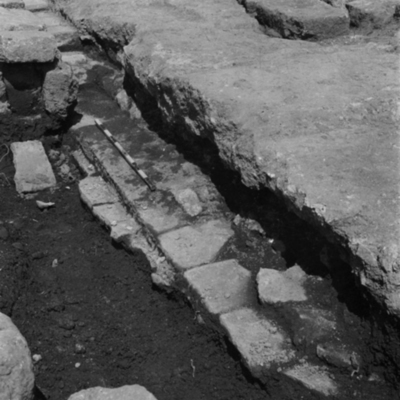 Canal along south side of Rooms 7 & 8. 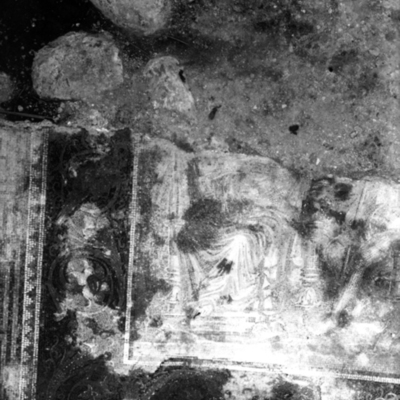 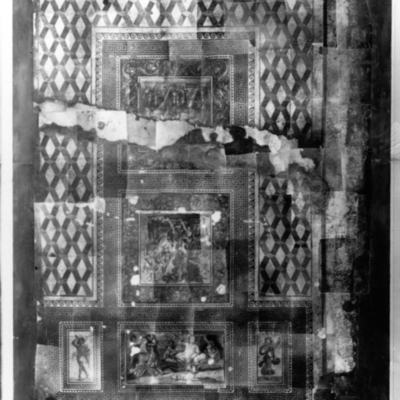 Detail view of Room 14. 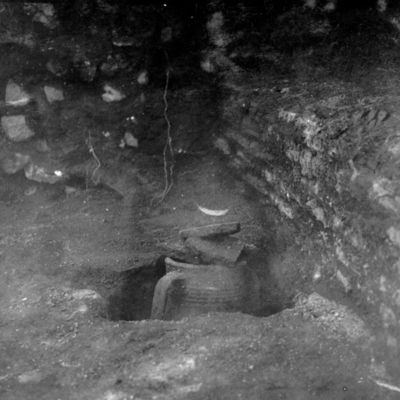 Water system in Room 24. 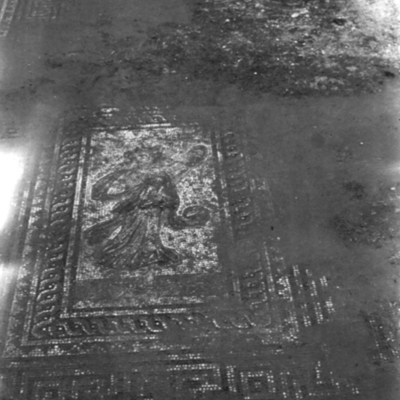 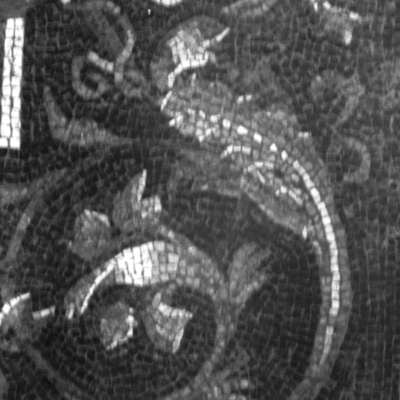 Detail of water connection in Room 24. 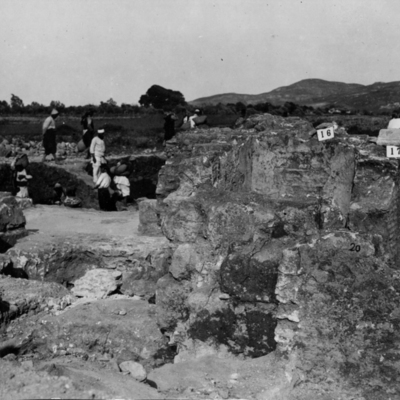 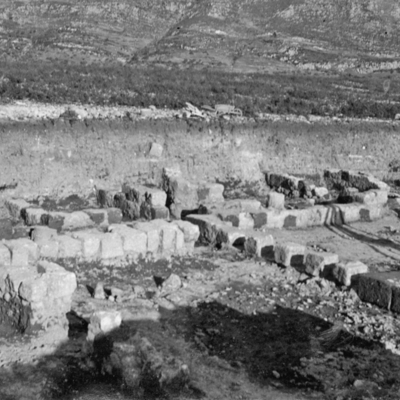 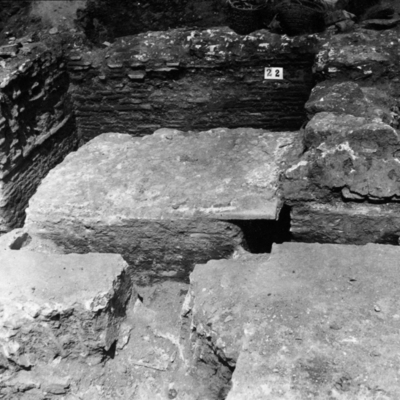 General view of Room 18. 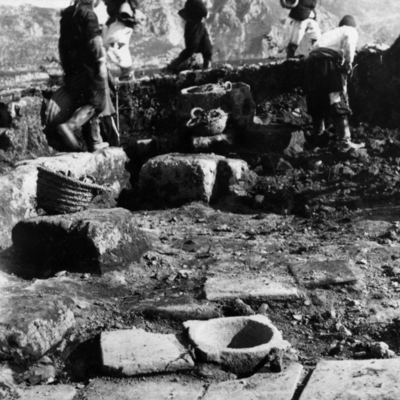 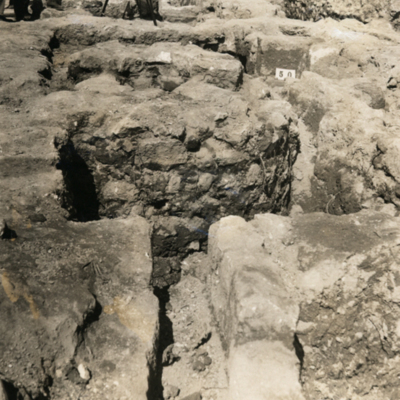 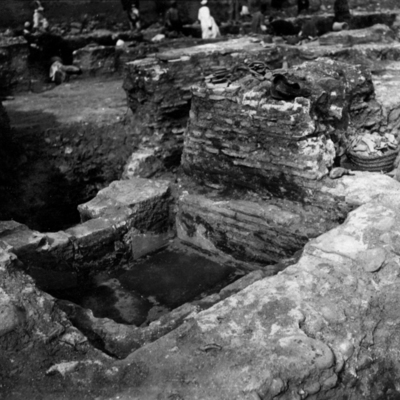 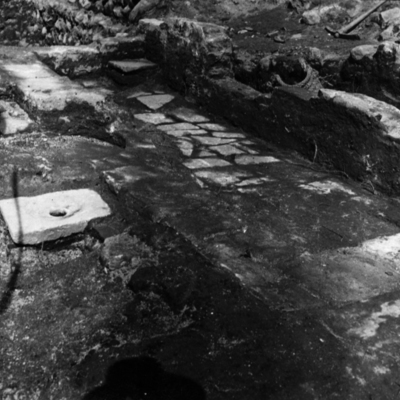 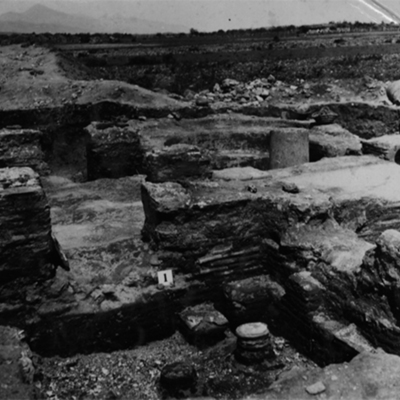 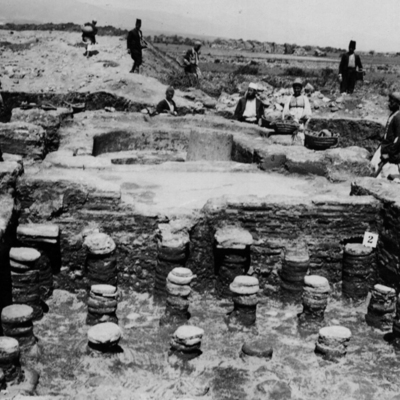 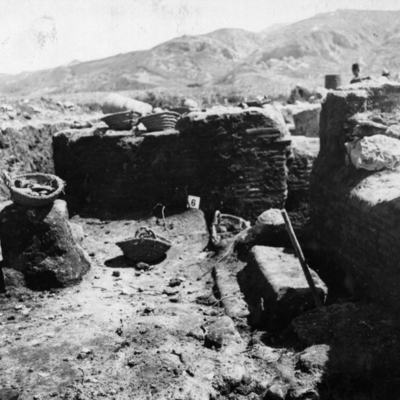 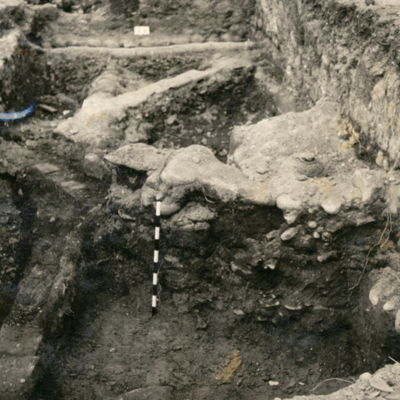 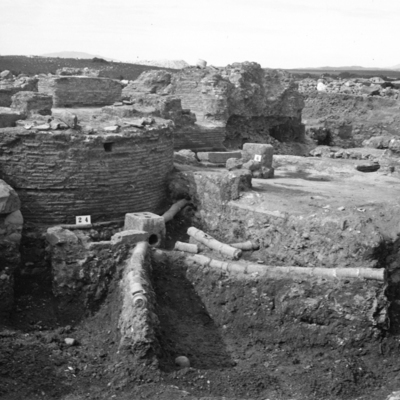 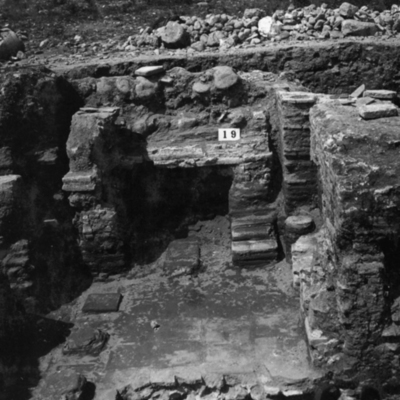 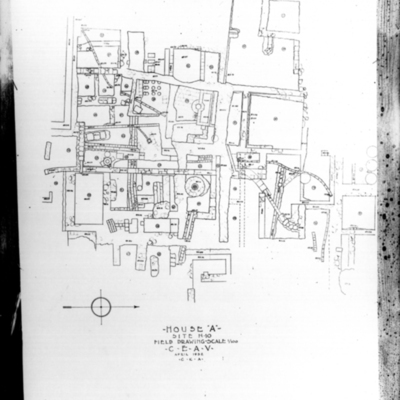 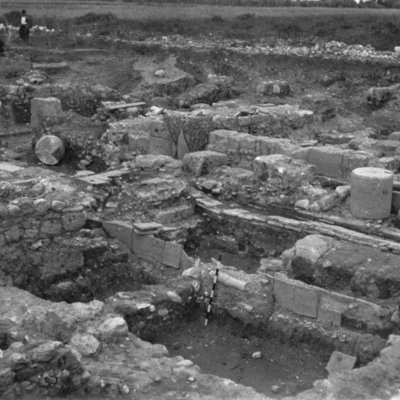 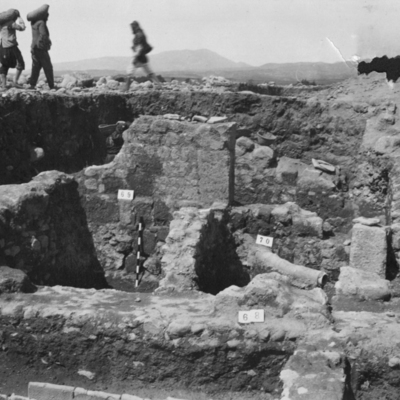 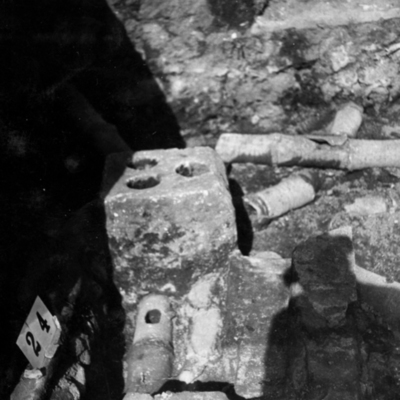 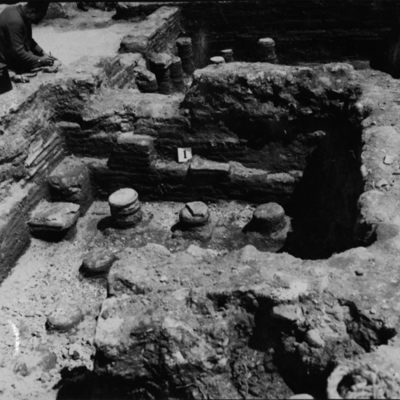 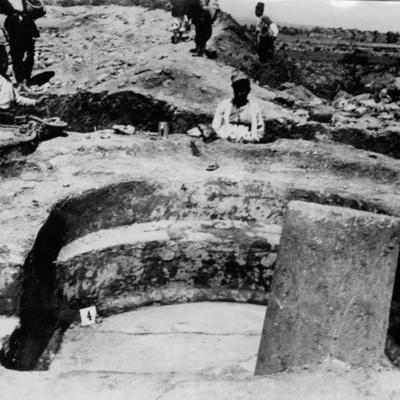 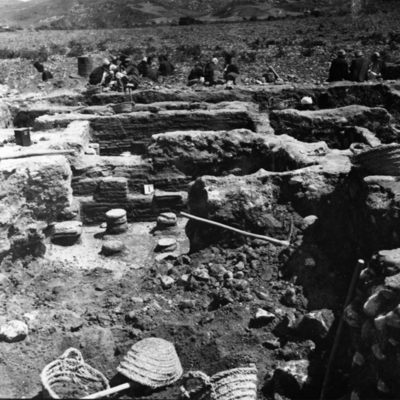 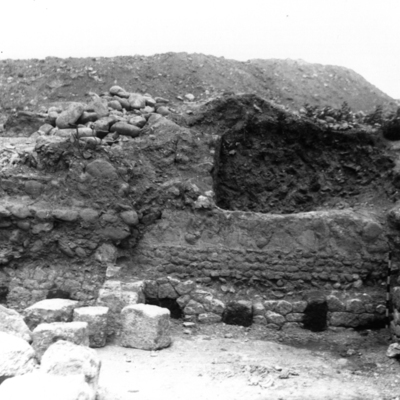 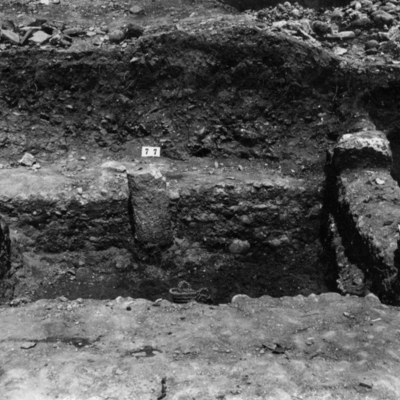 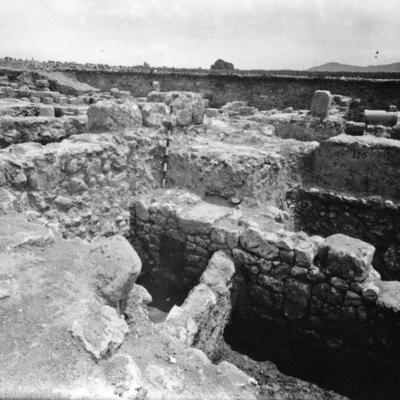 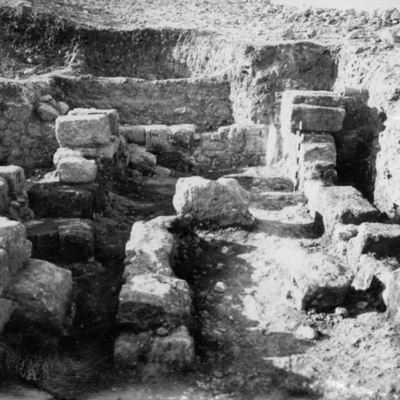 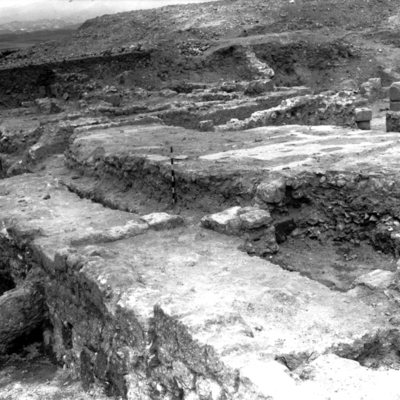 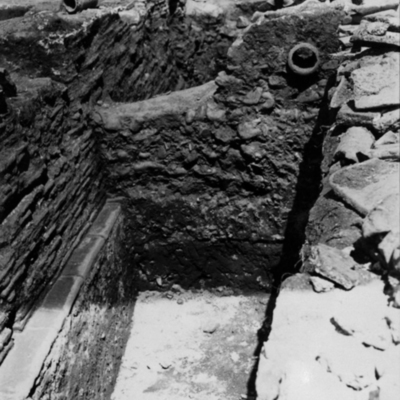 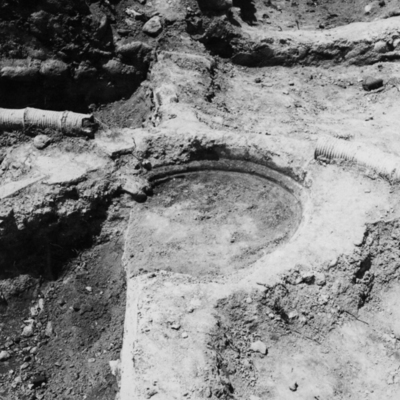 General view of Room 24 showing complex of water pipes. 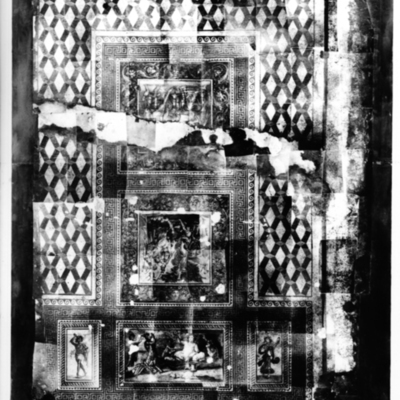 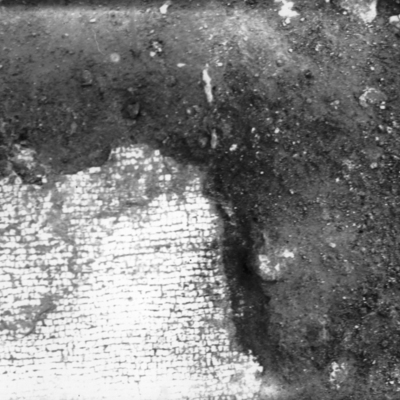 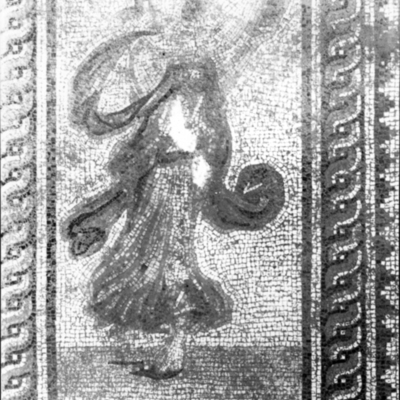 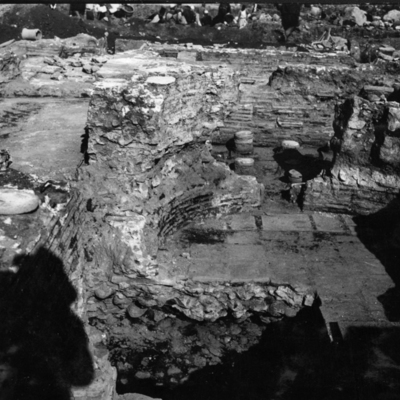 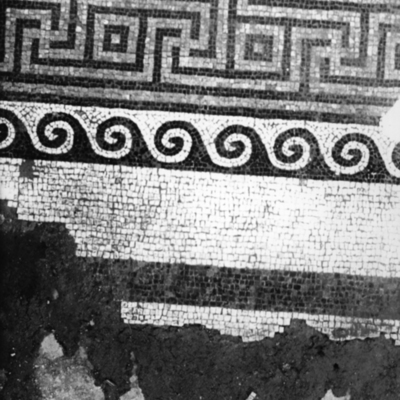 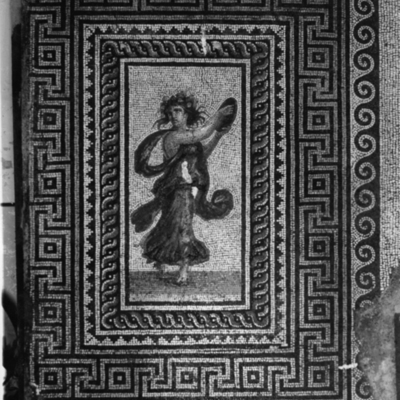 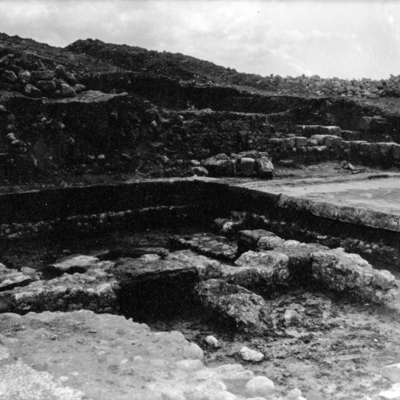 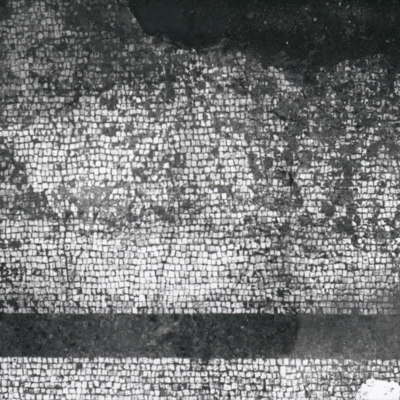 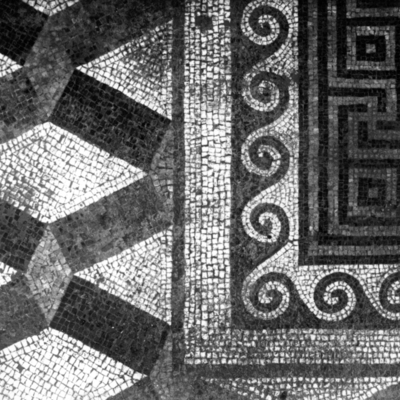 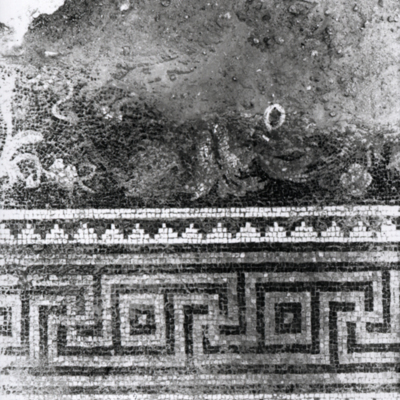 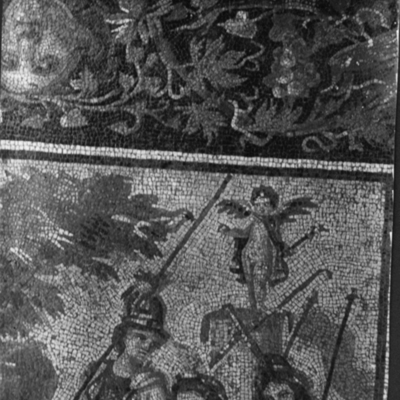 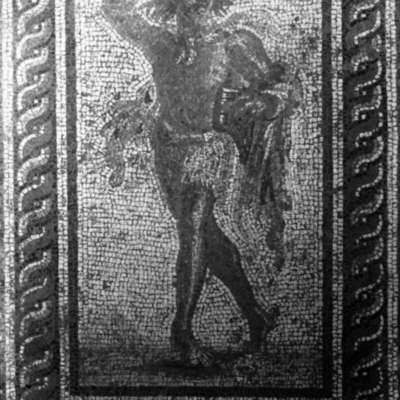 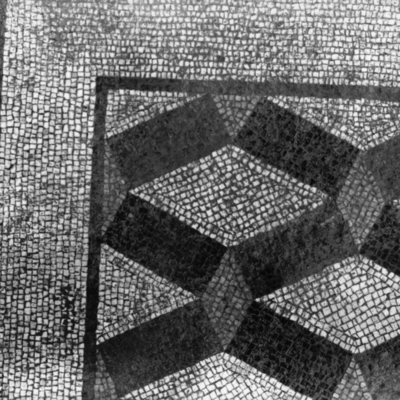 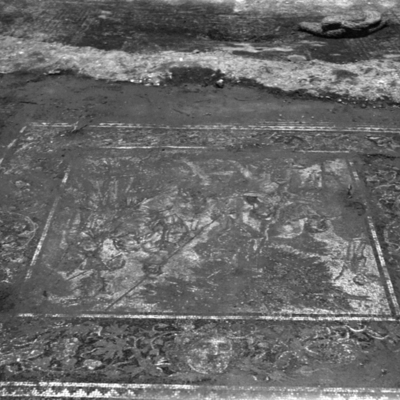 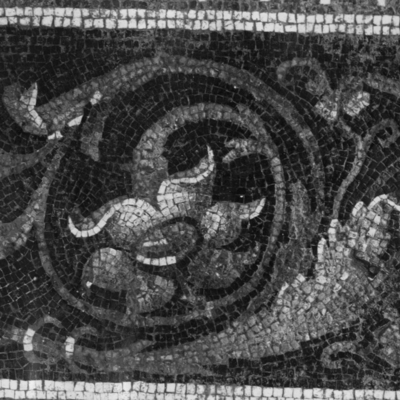 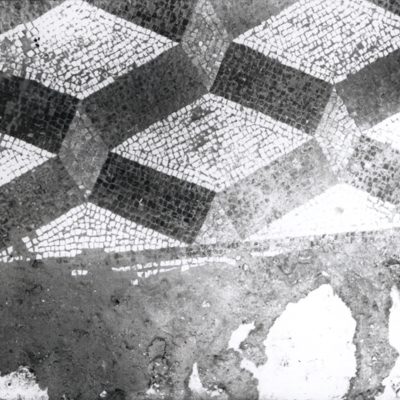 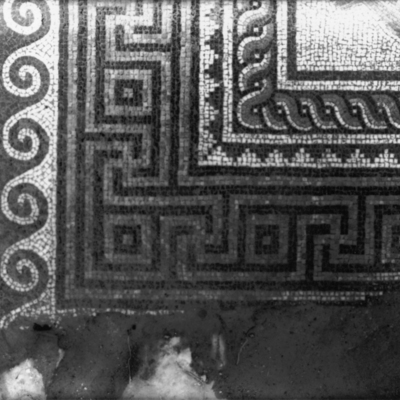 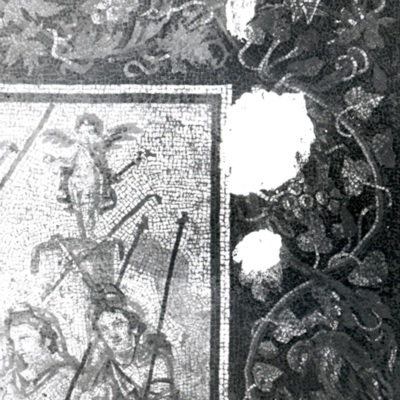 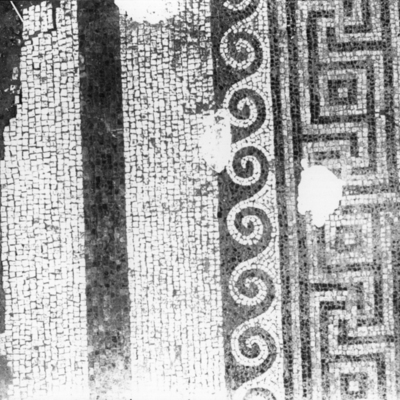 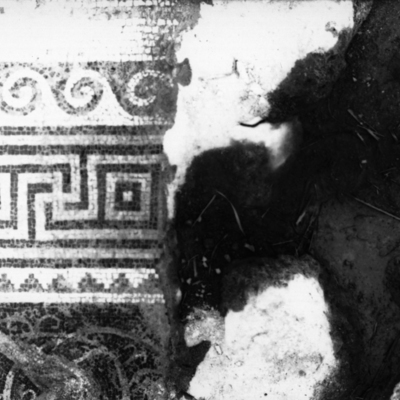 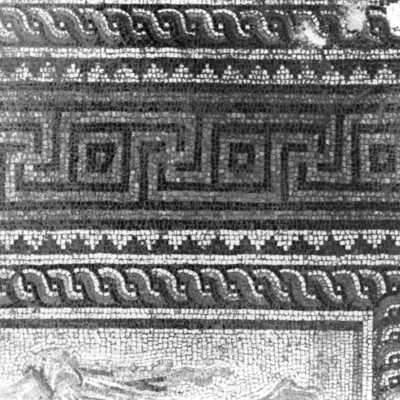 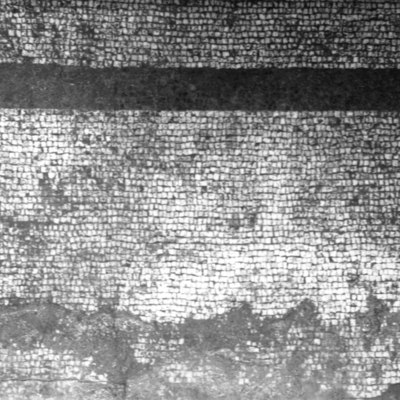 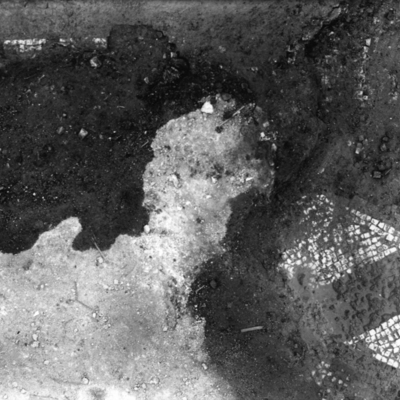 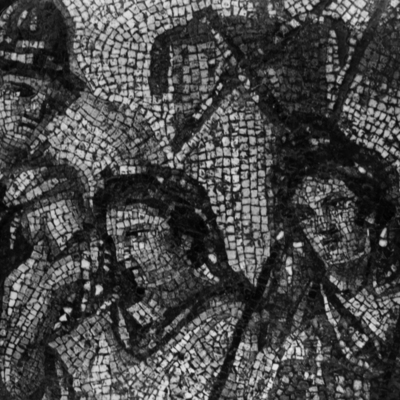 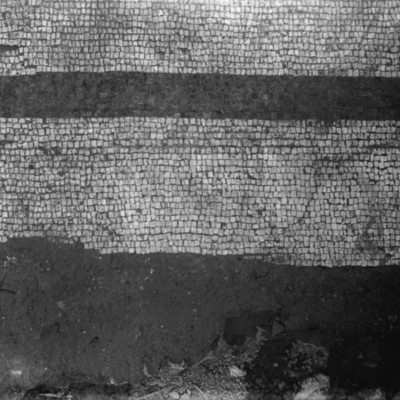 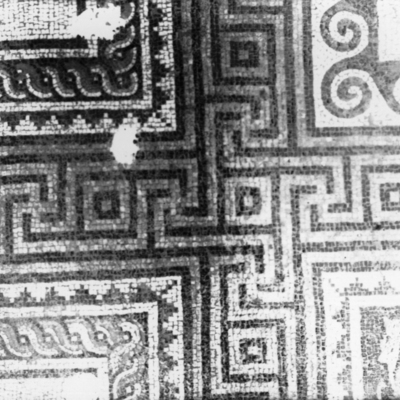 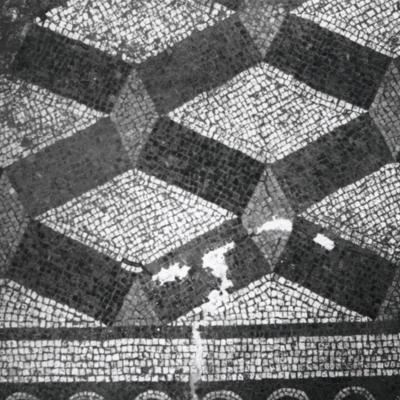 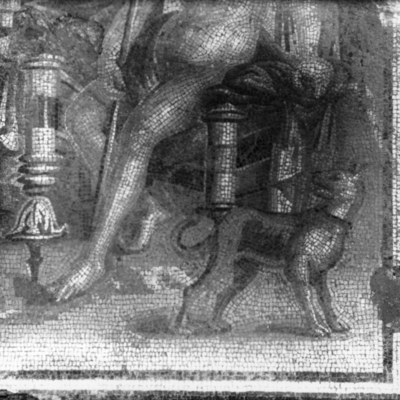 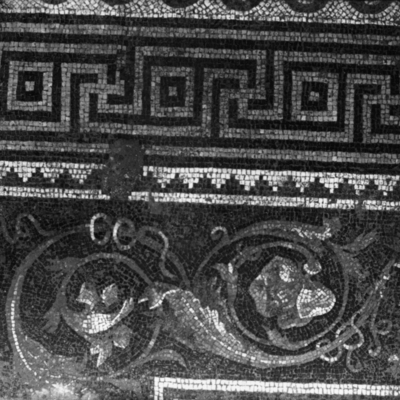 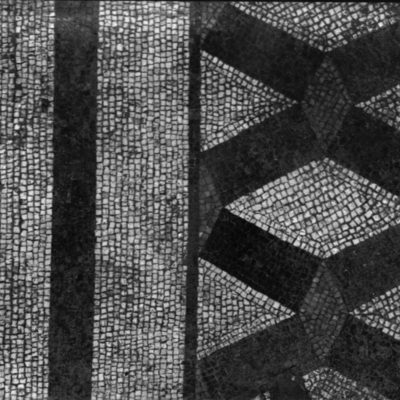 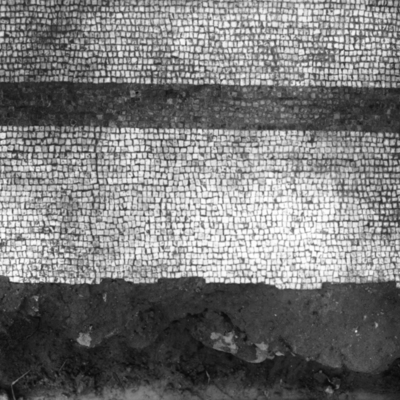 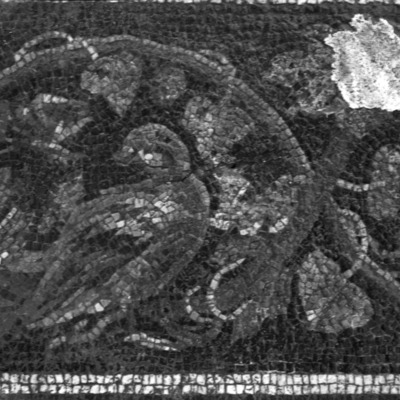 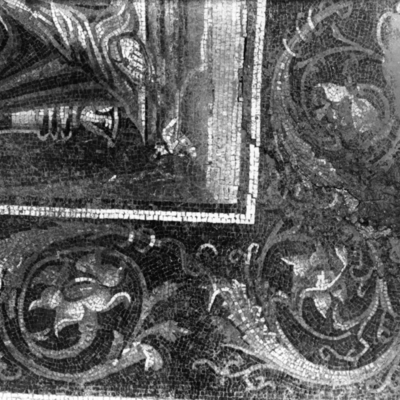 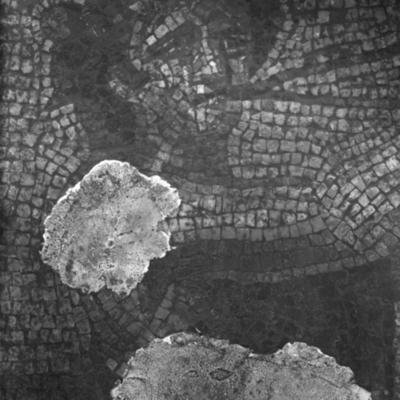 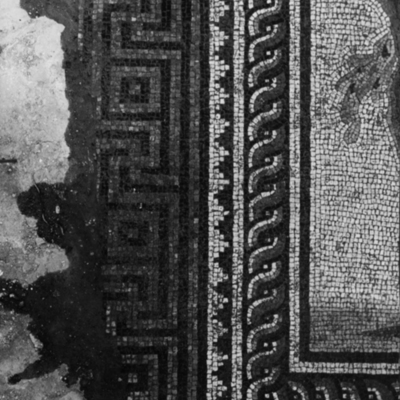 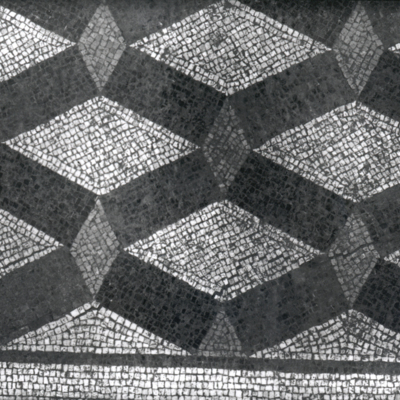 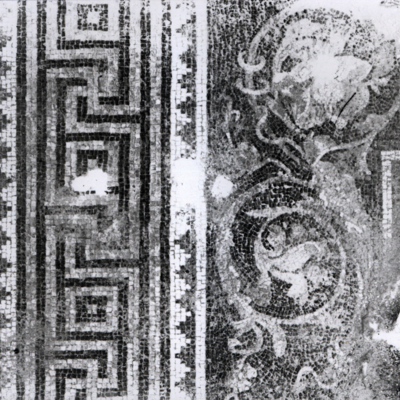 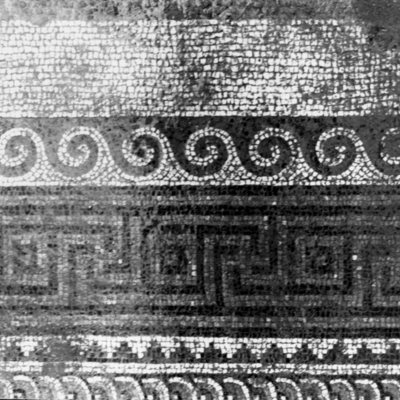 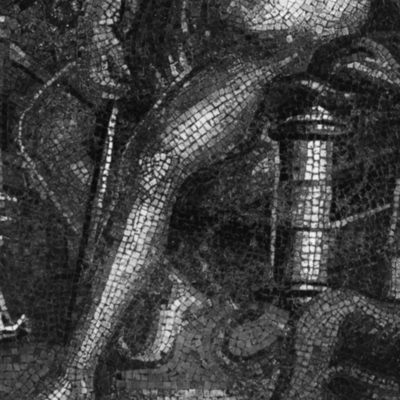 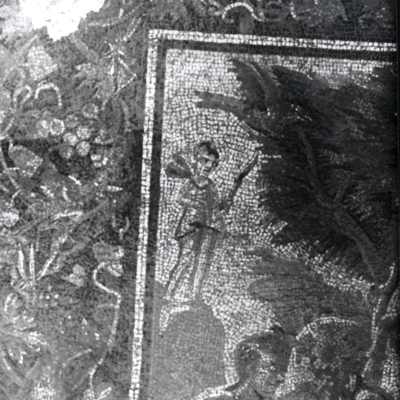 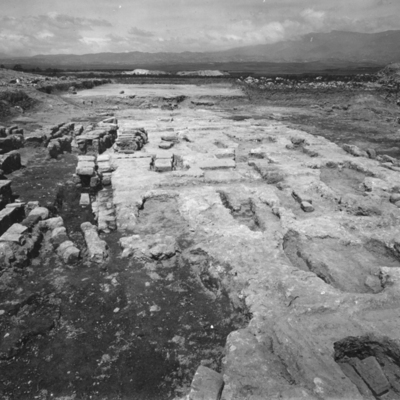 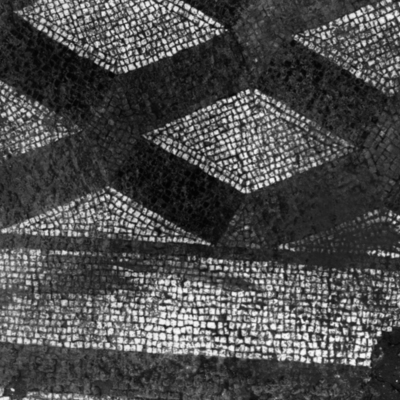 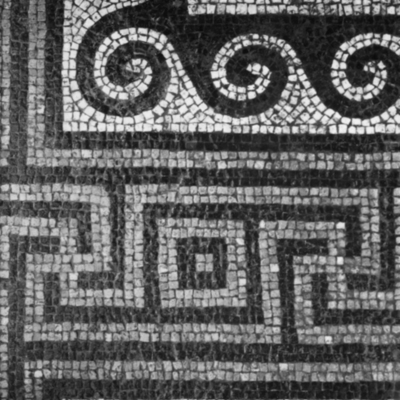 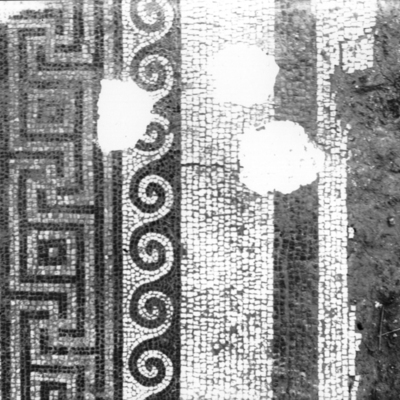 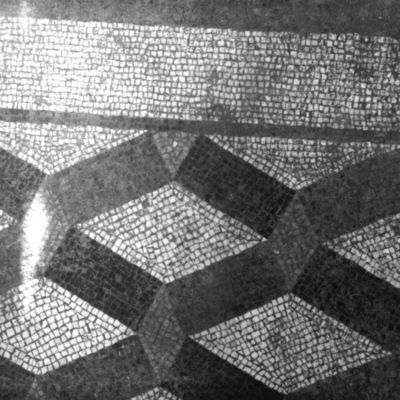 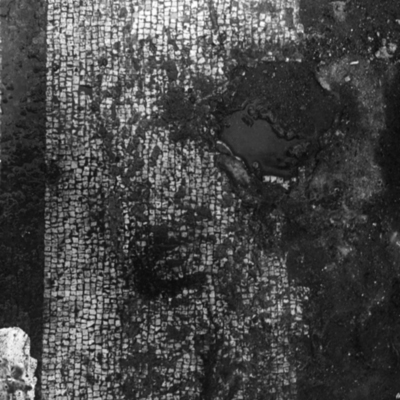 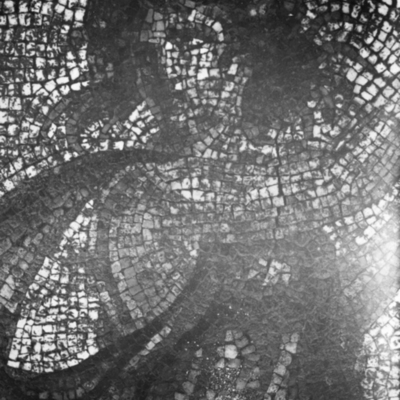 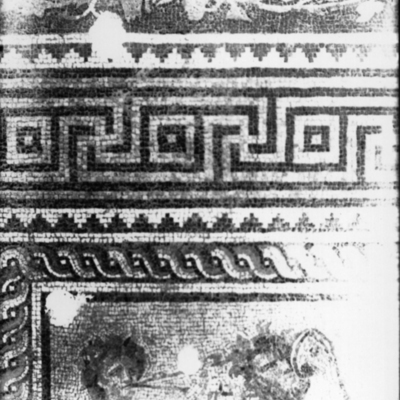 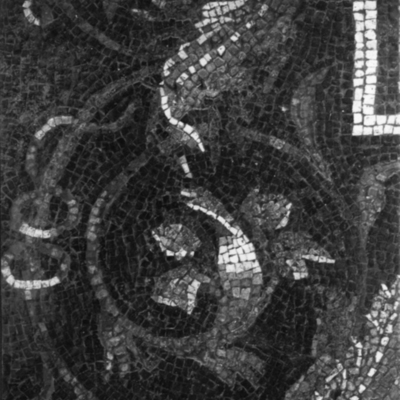 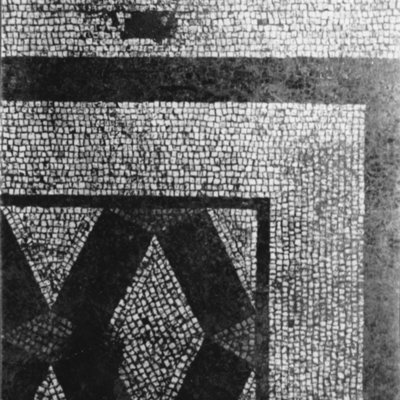 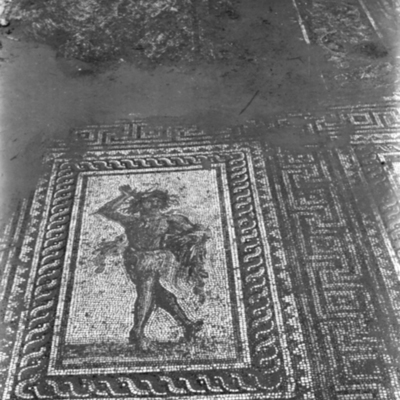 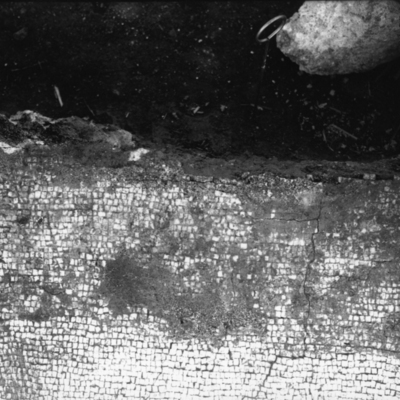 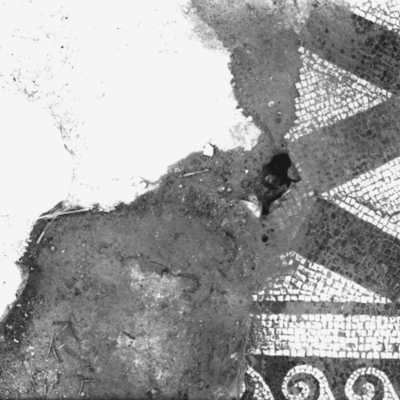 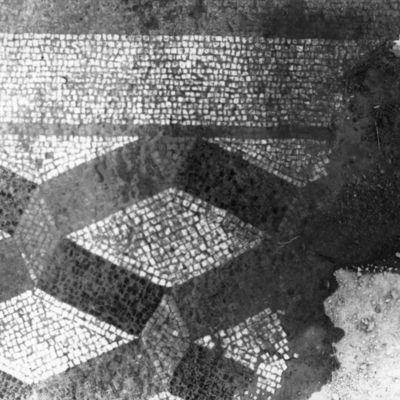 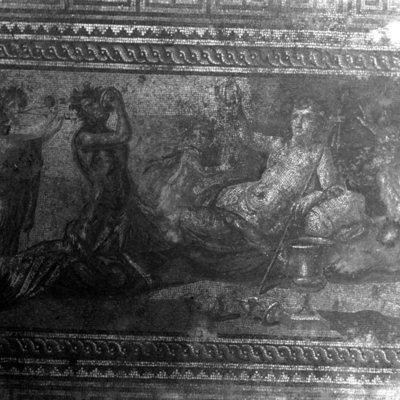 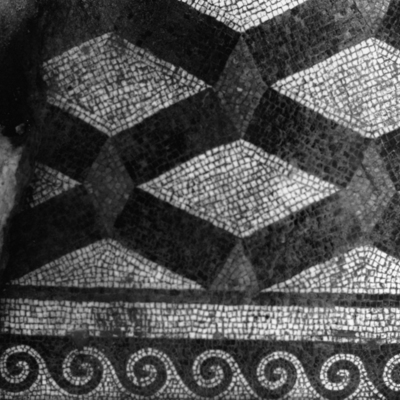 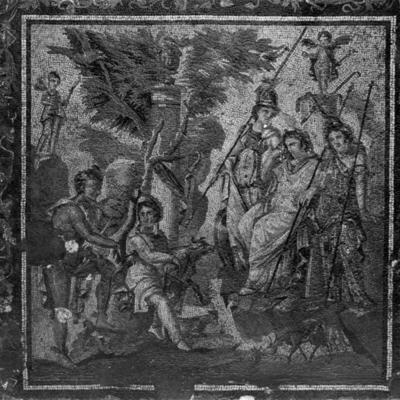 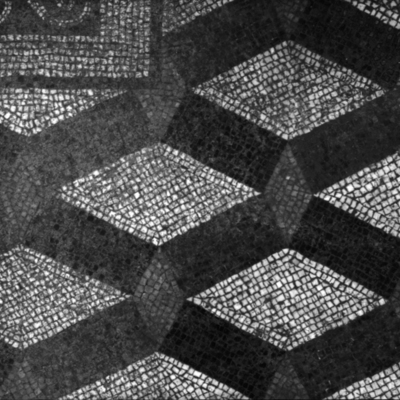 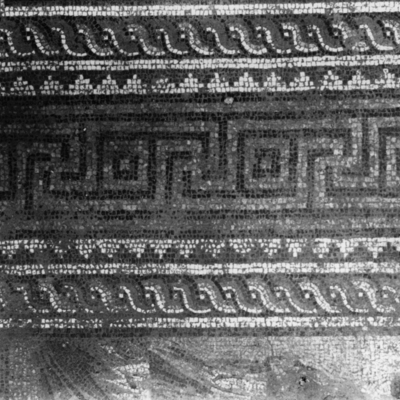 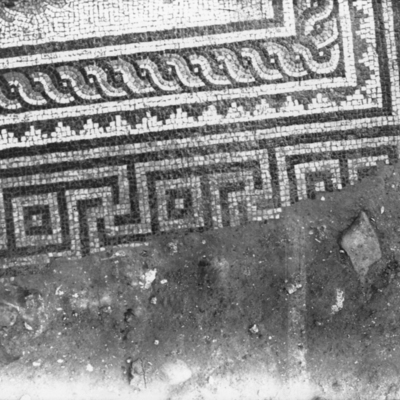 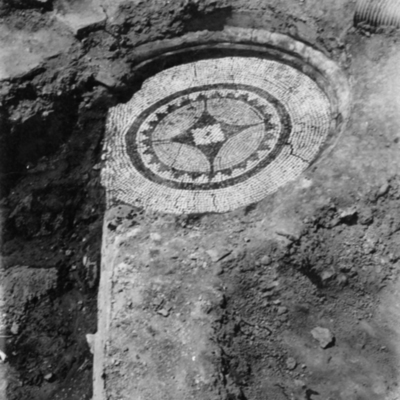 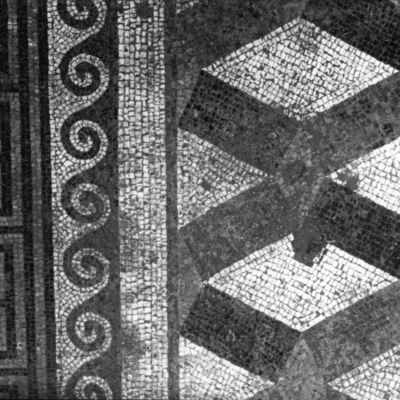 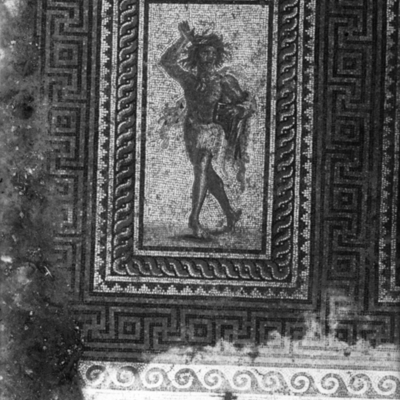 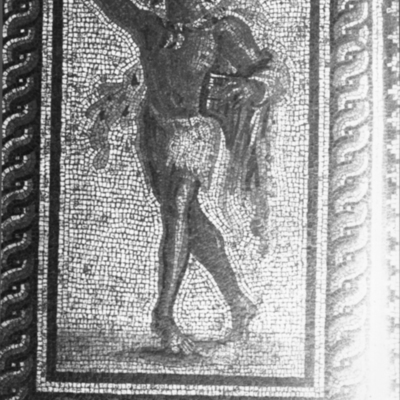 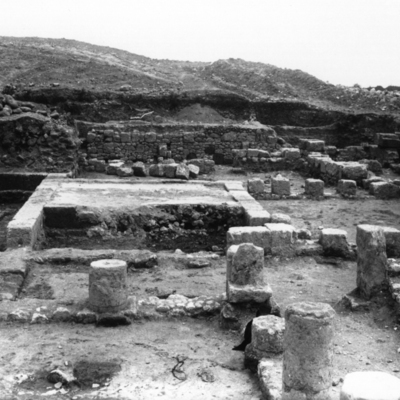 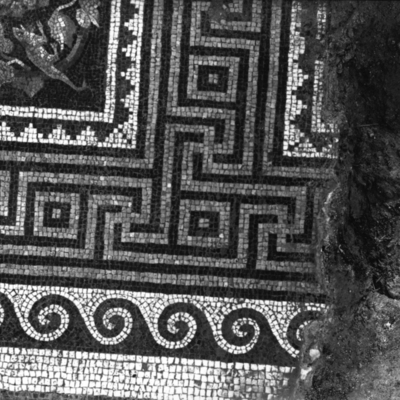 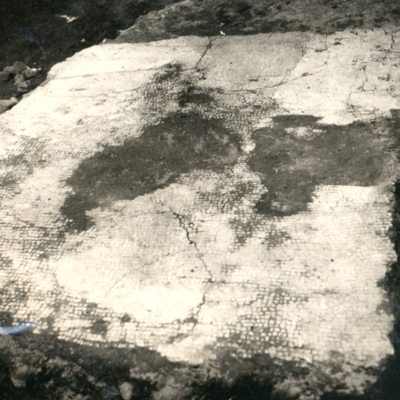 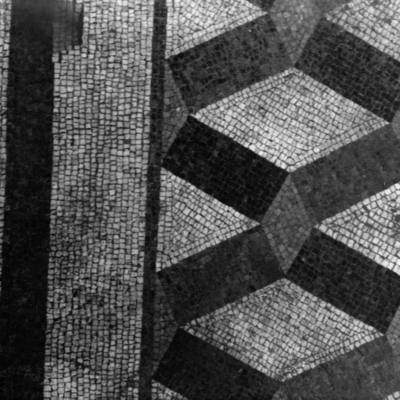 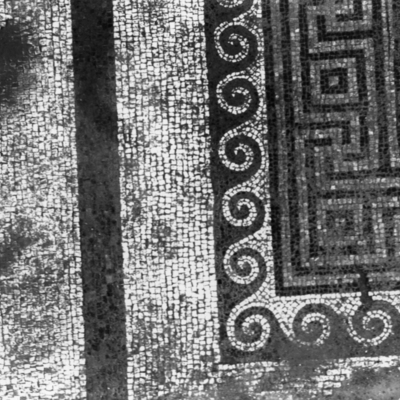 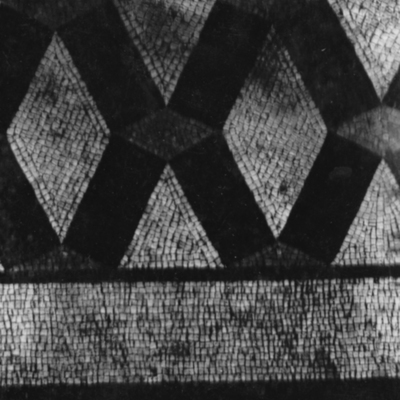 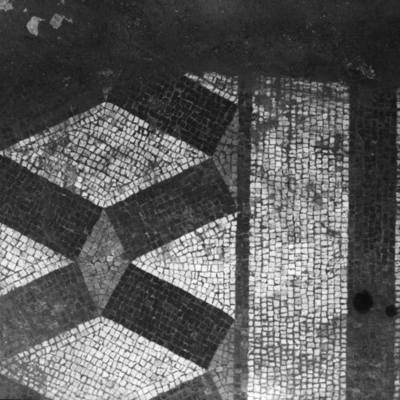 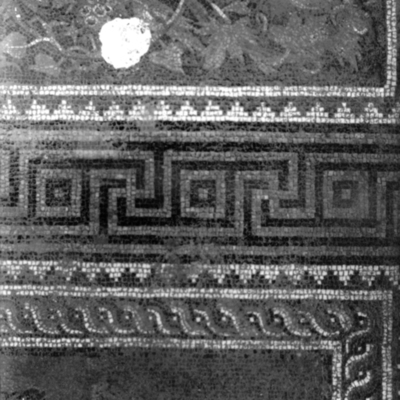 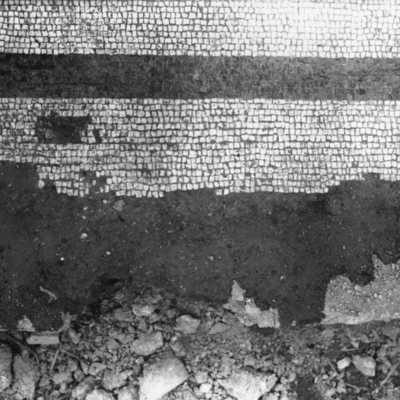 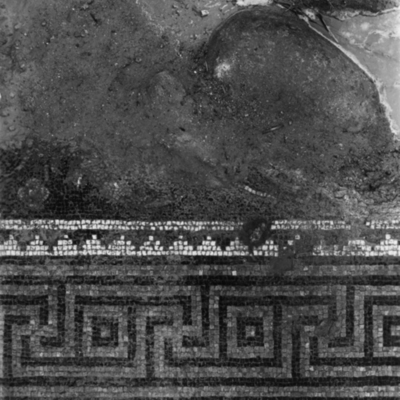 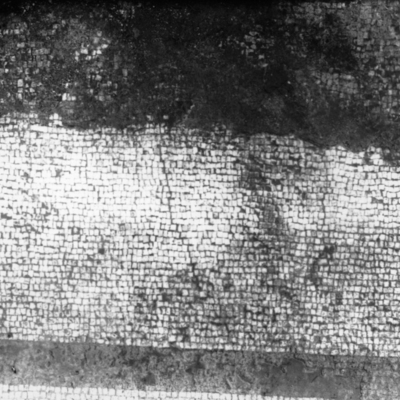 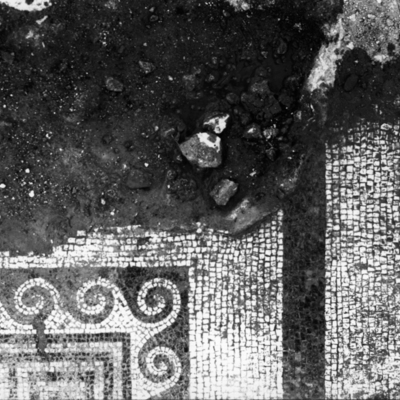 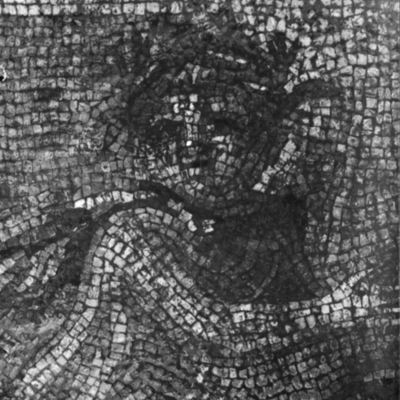 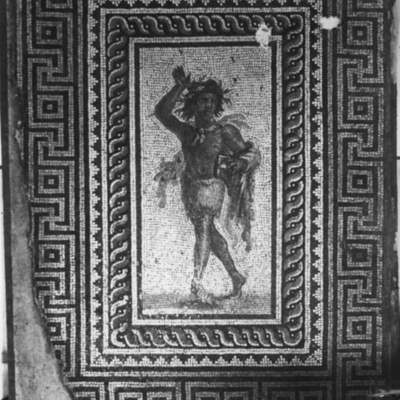 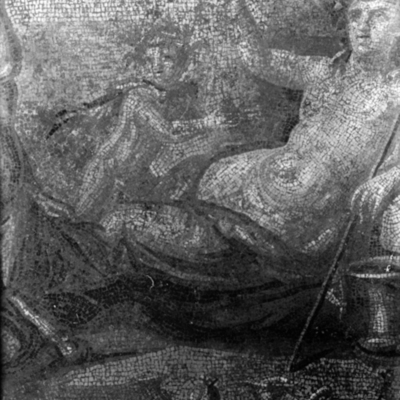 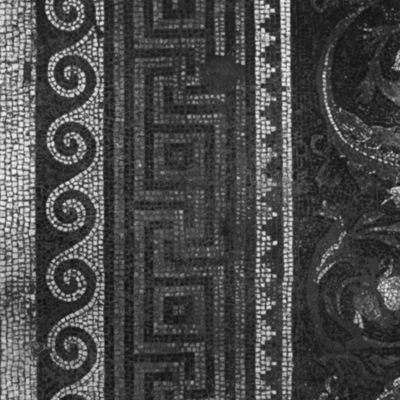 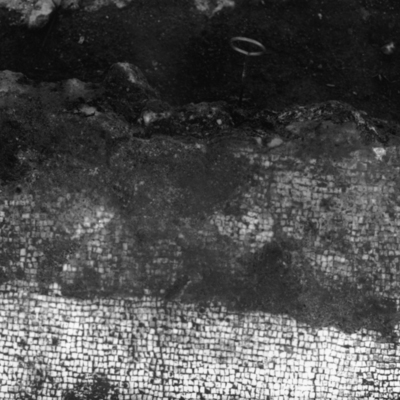 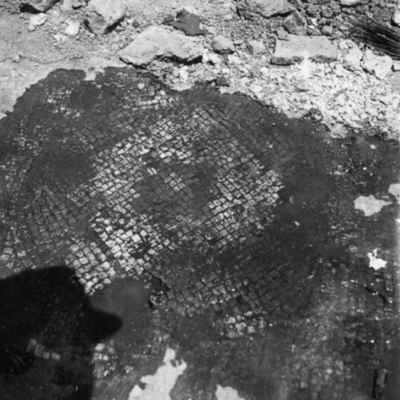 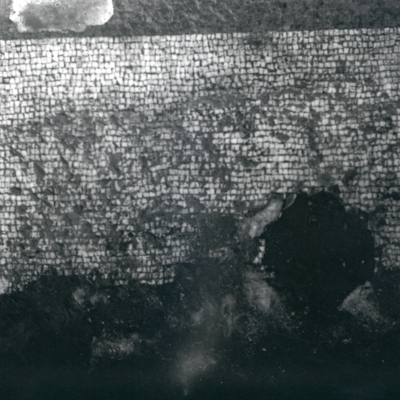 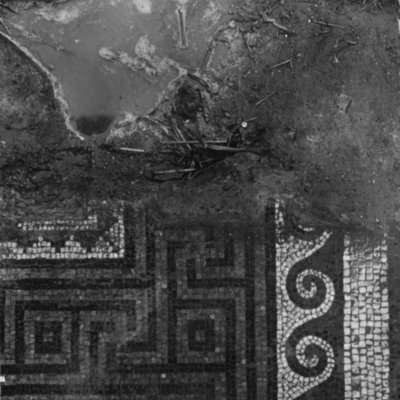 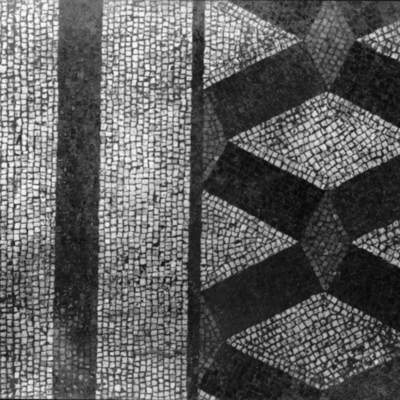 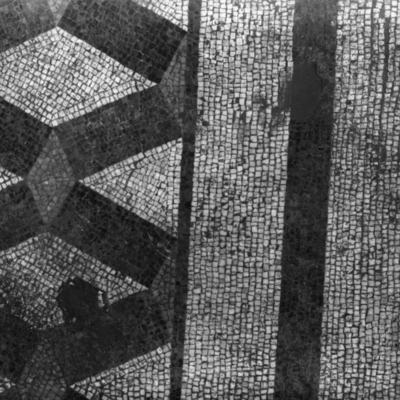 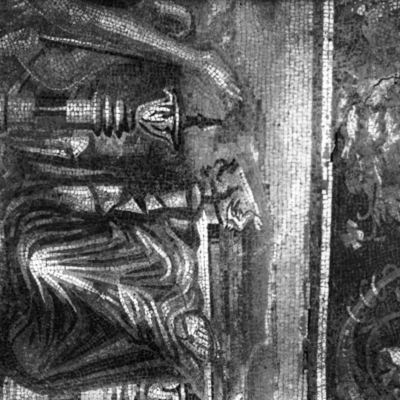 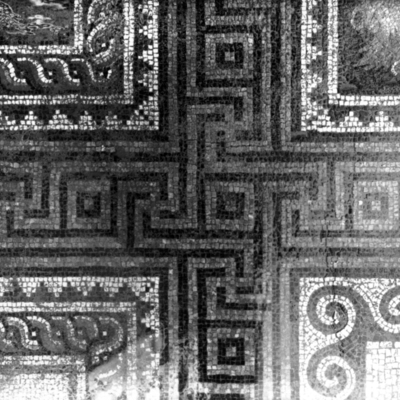 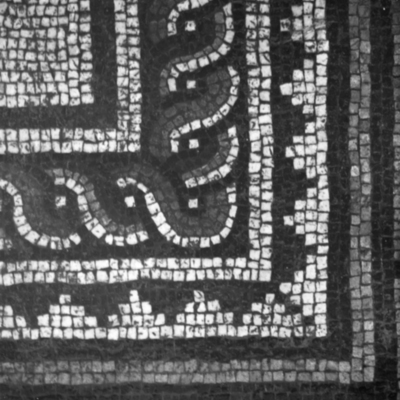 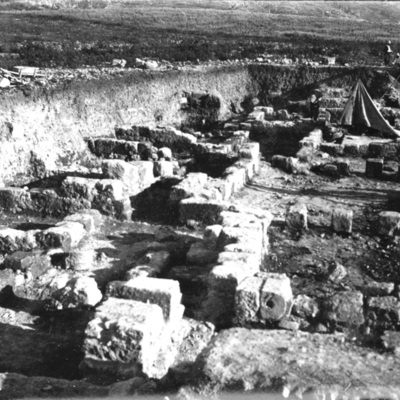 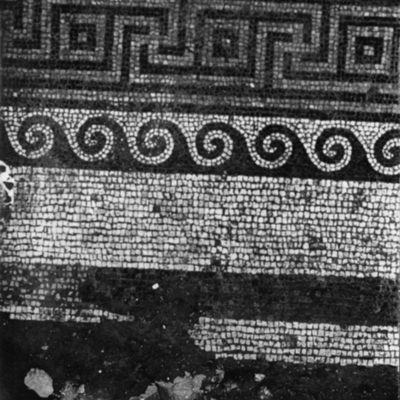 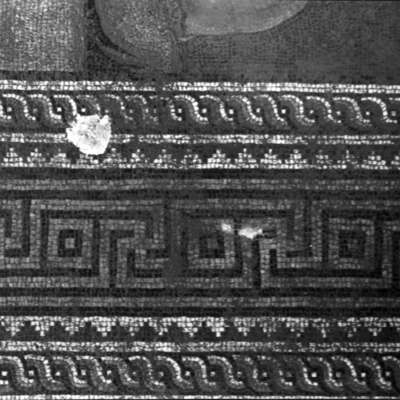 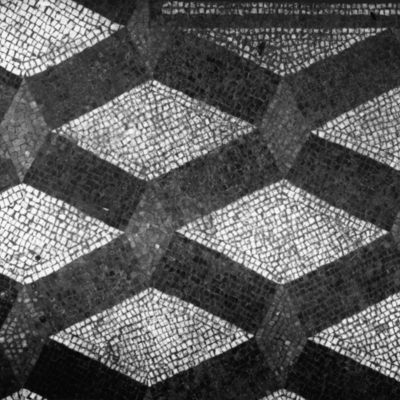 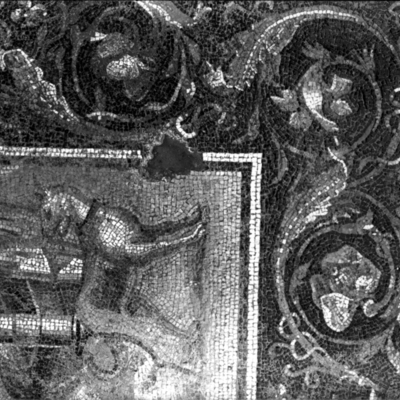 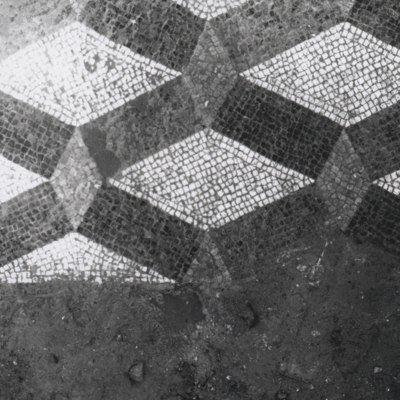 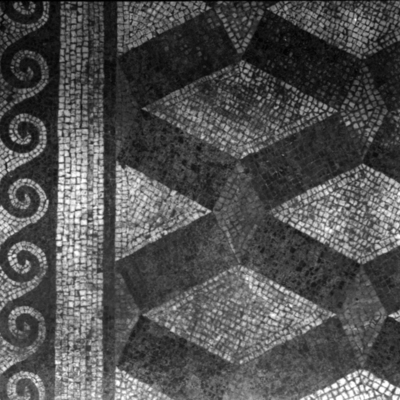 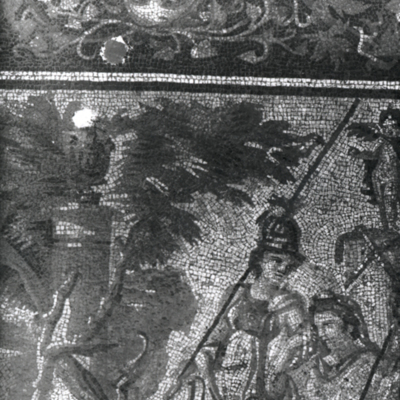 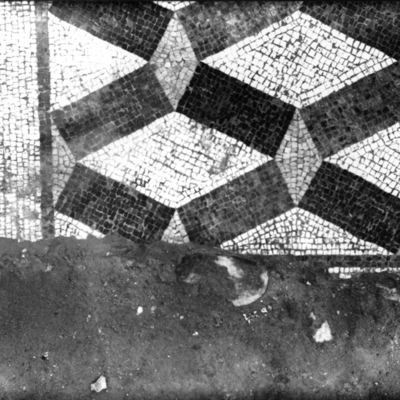 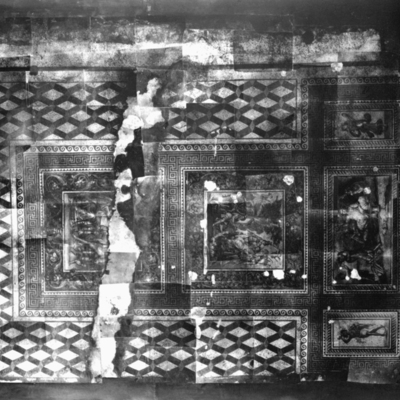 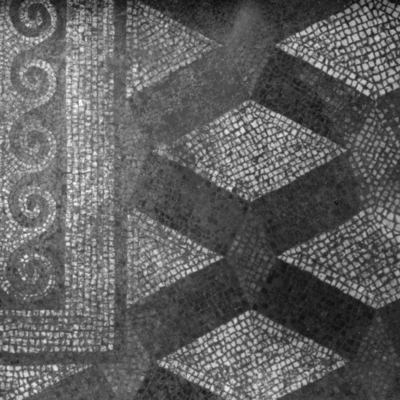 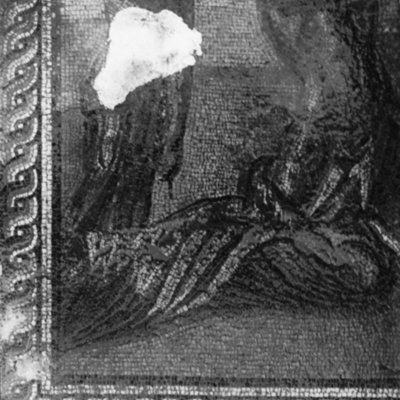 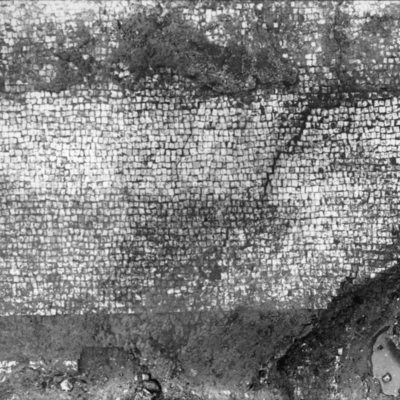 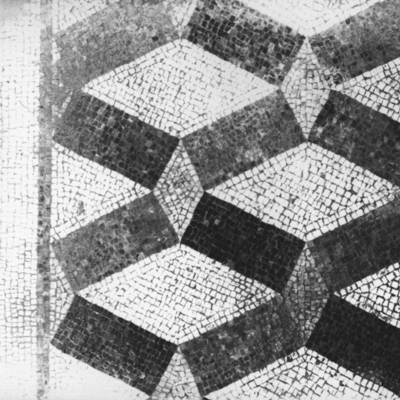 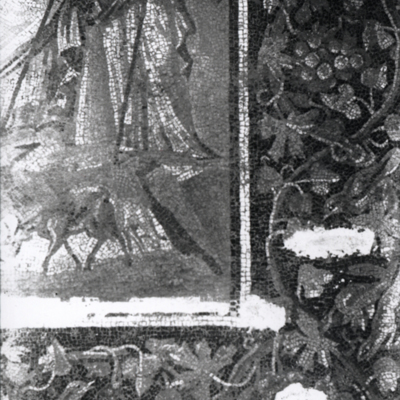 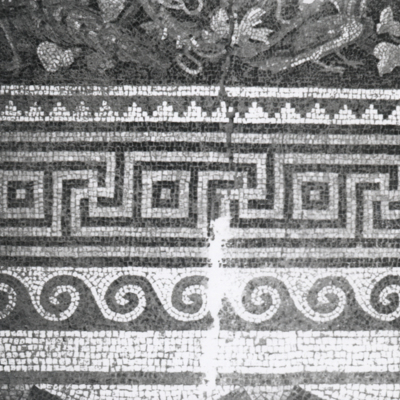 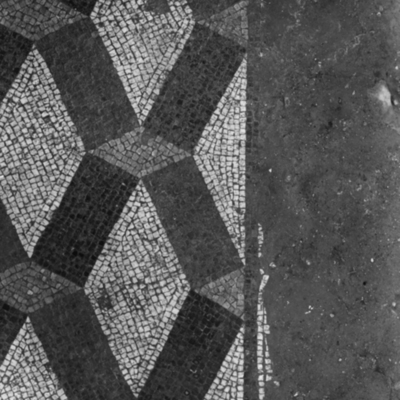 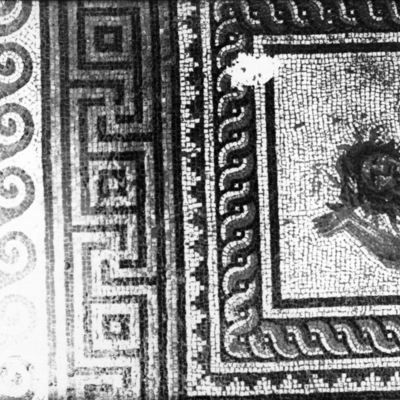 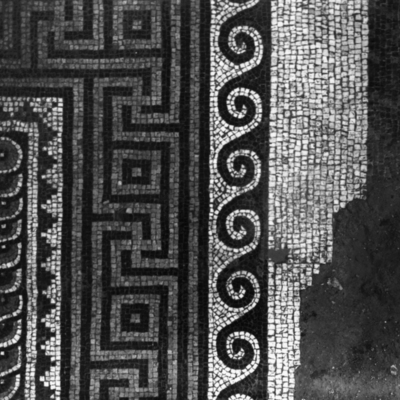 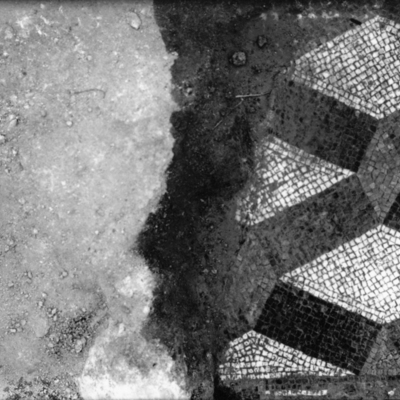 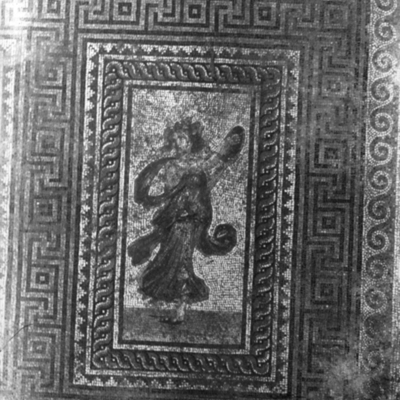 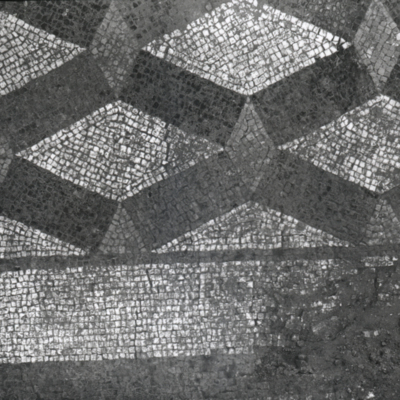 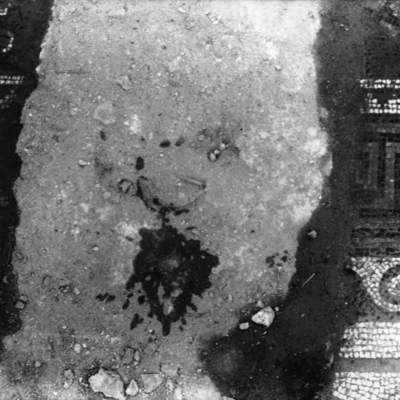 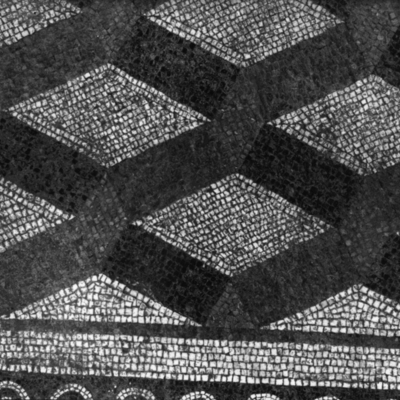 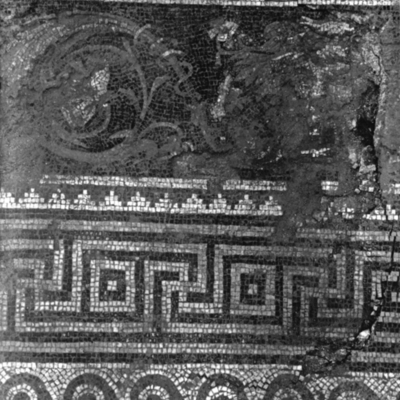 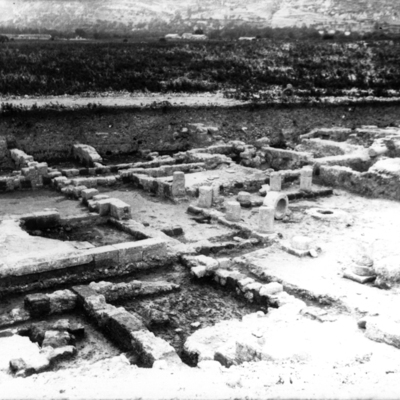 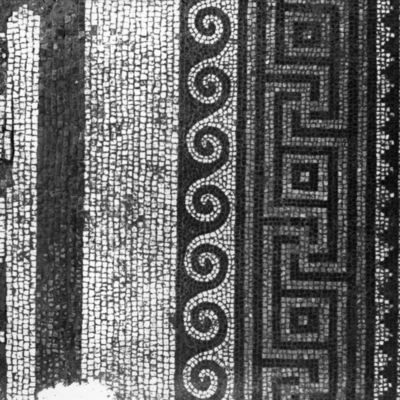 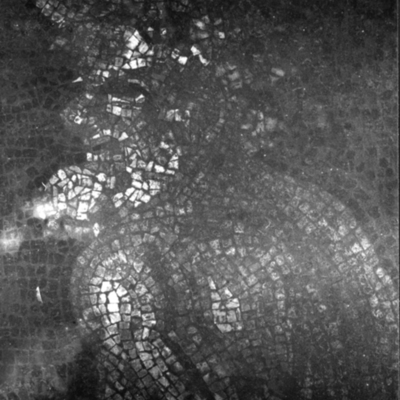 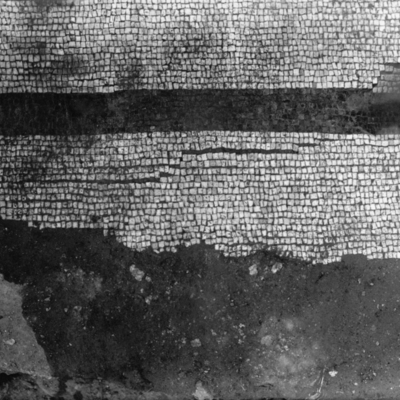 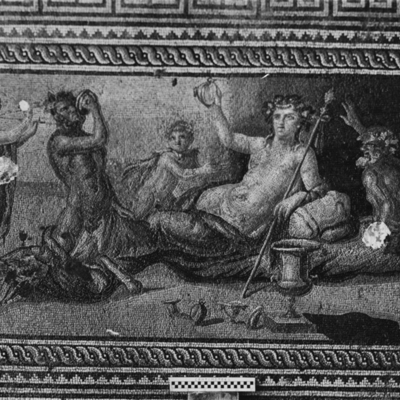 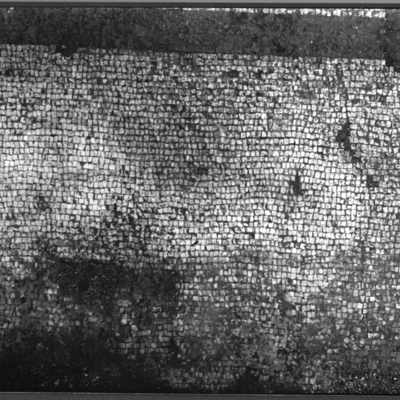 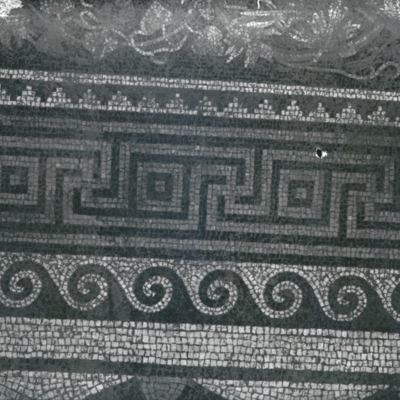 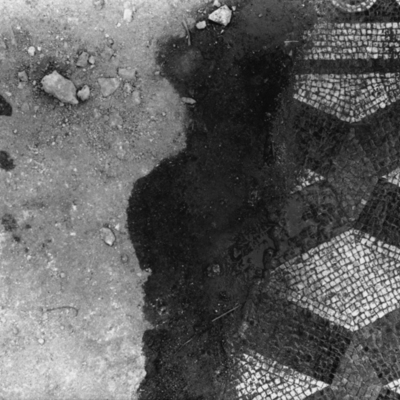 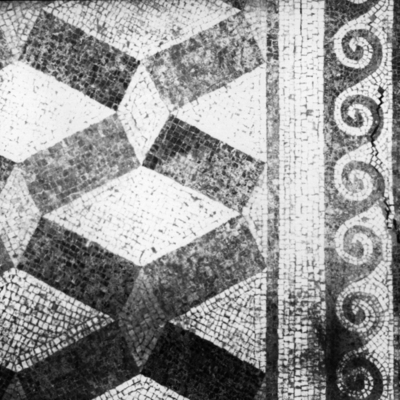 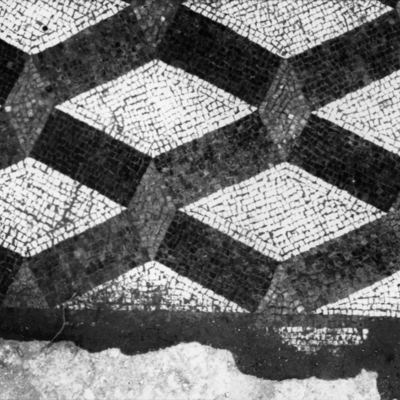 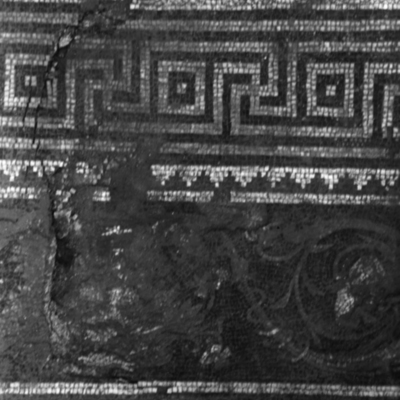 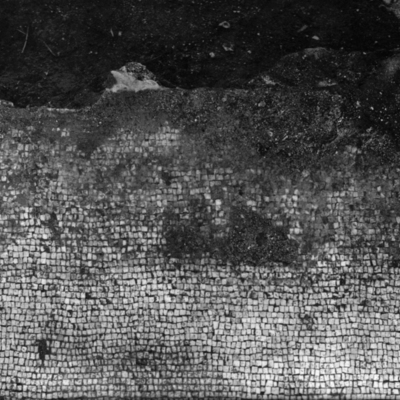 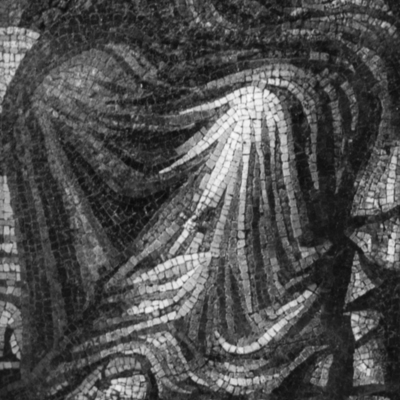 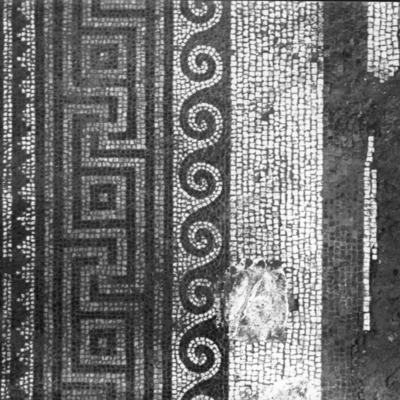 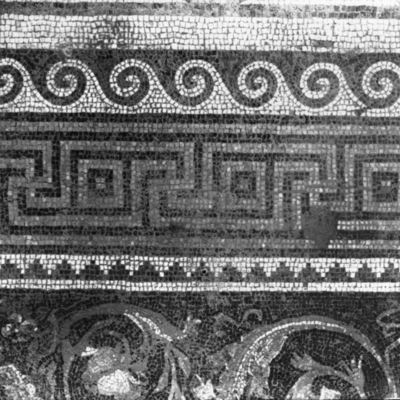 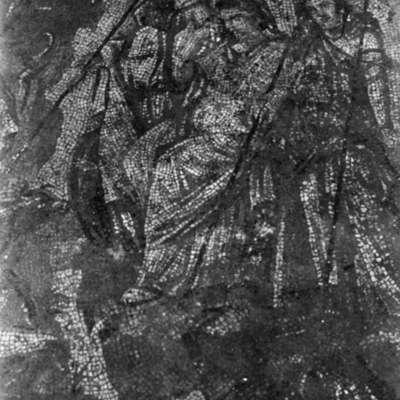 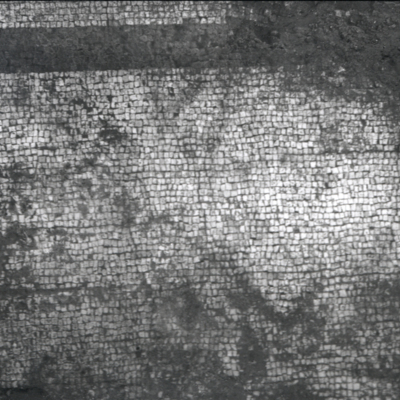 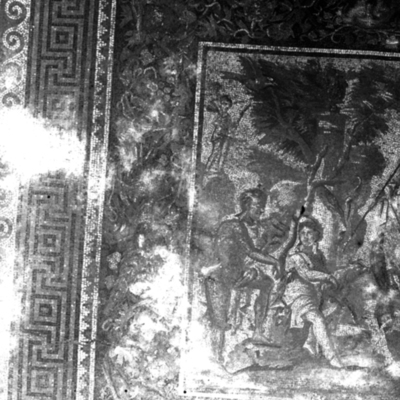 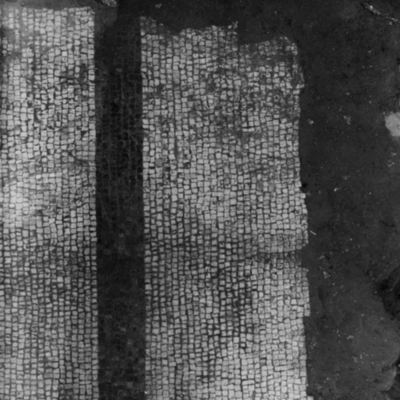 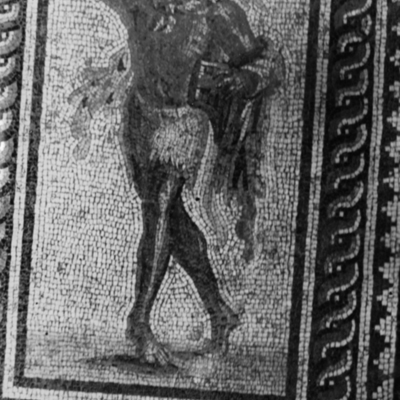 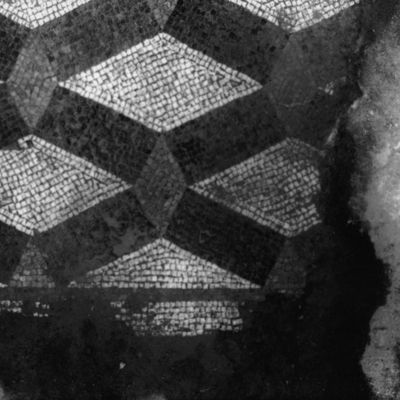 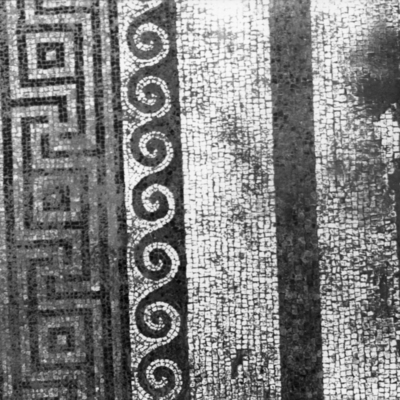 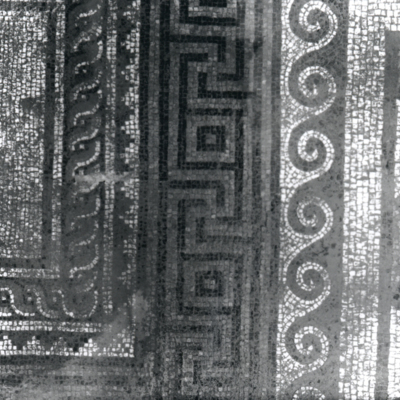 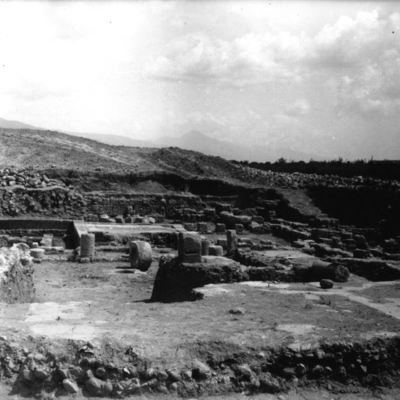 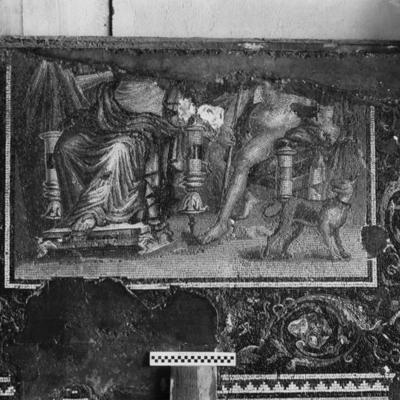 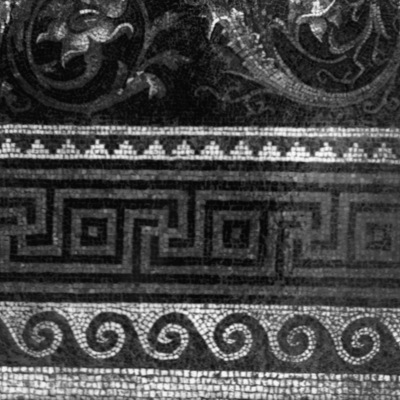 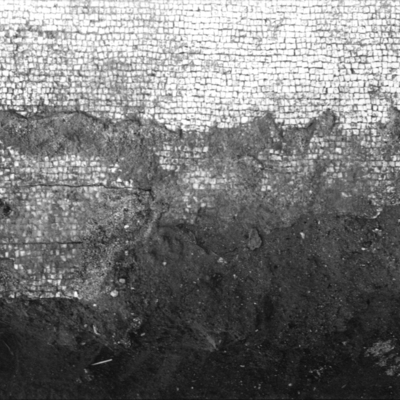 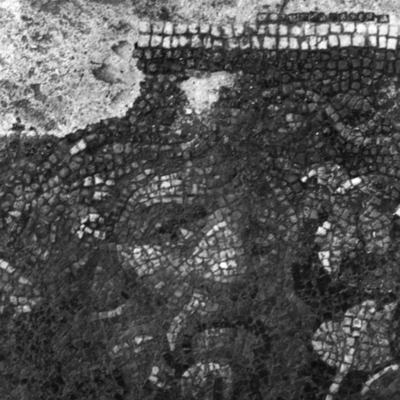 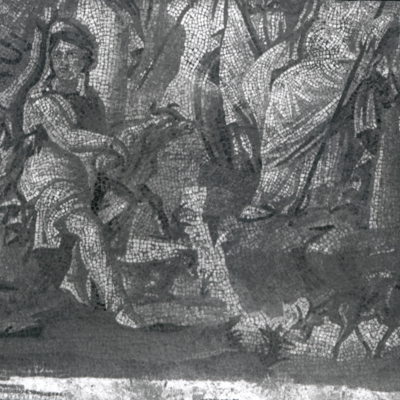 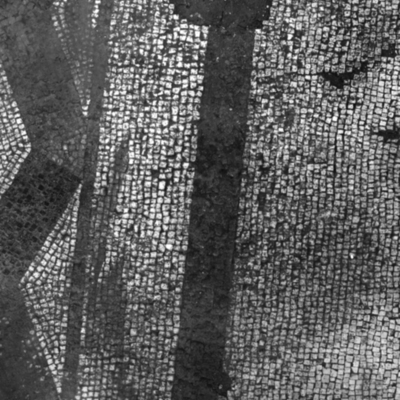 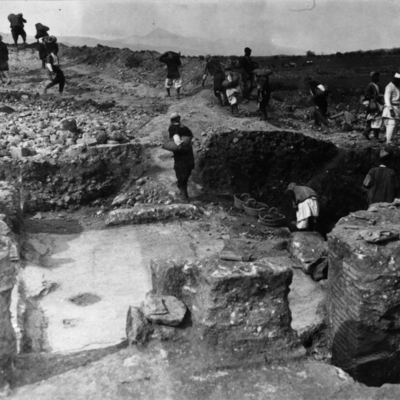 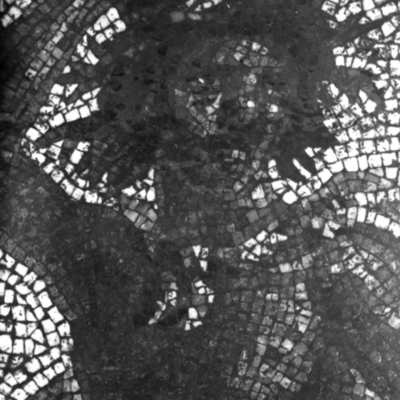 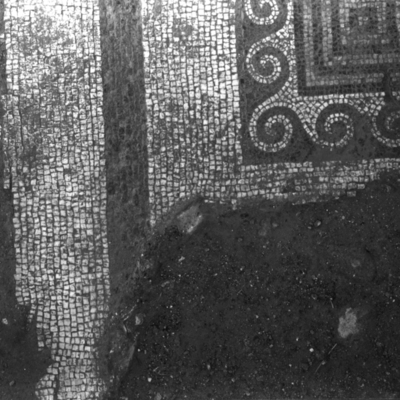 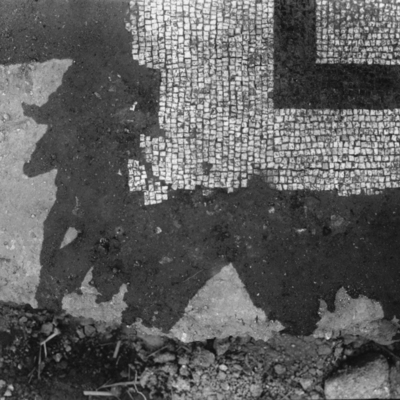 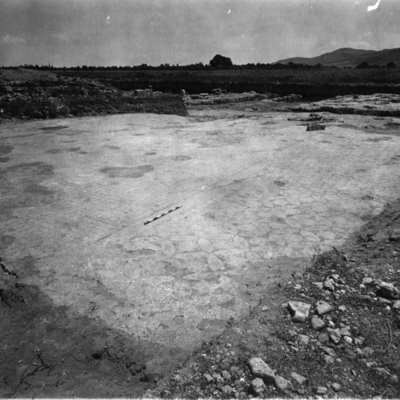 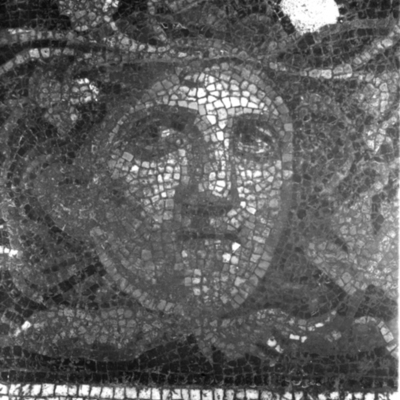 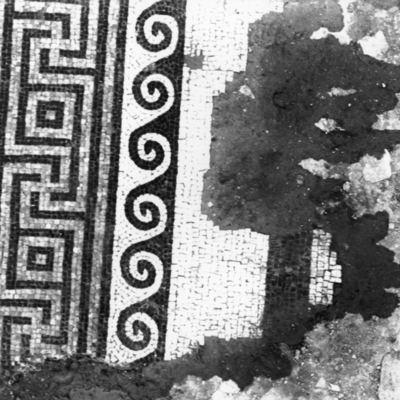 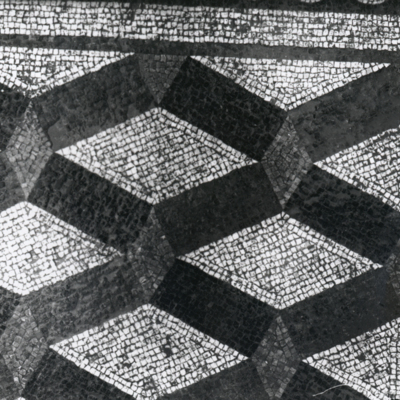 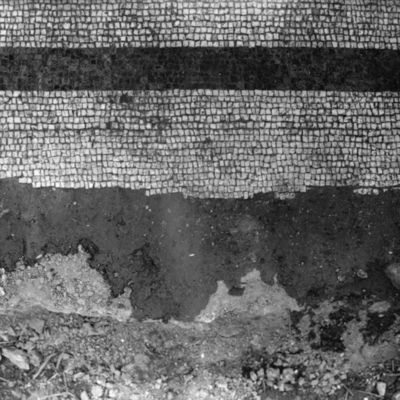 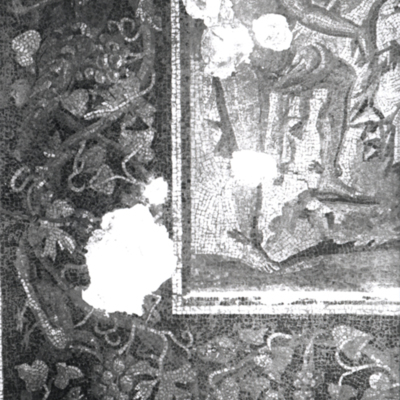 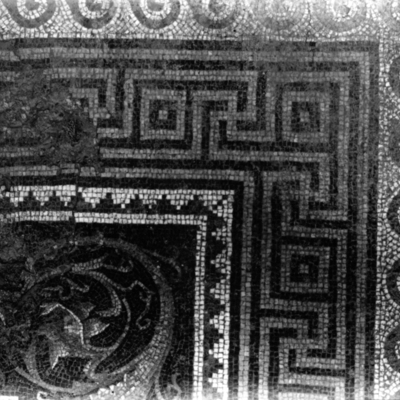 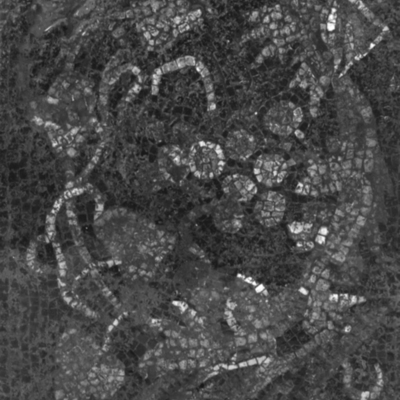 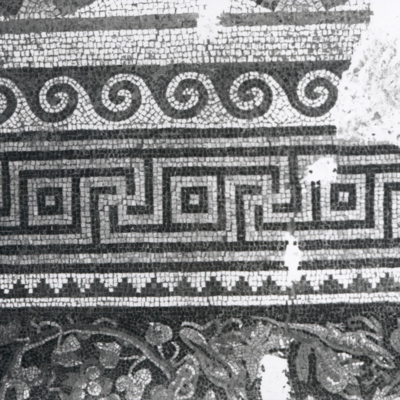 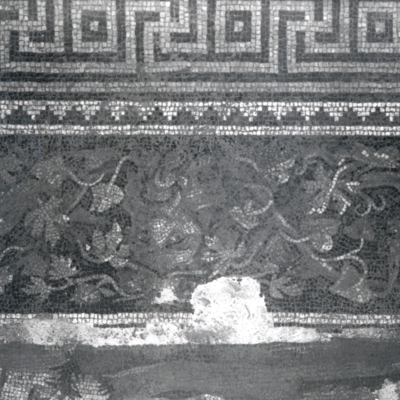 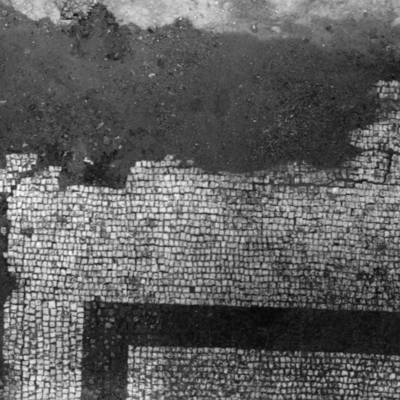 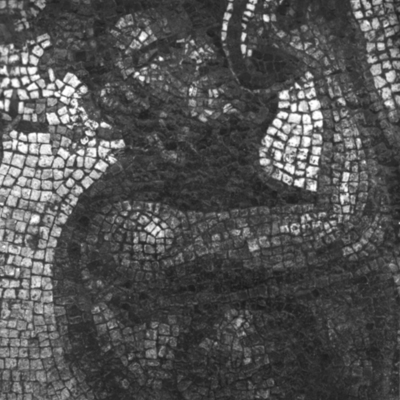 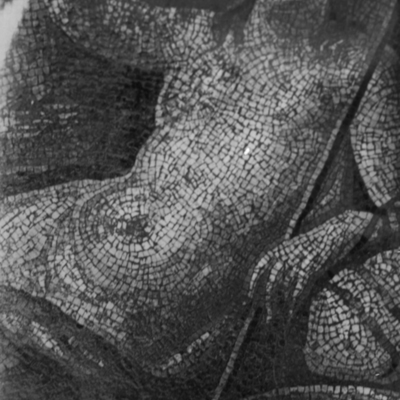 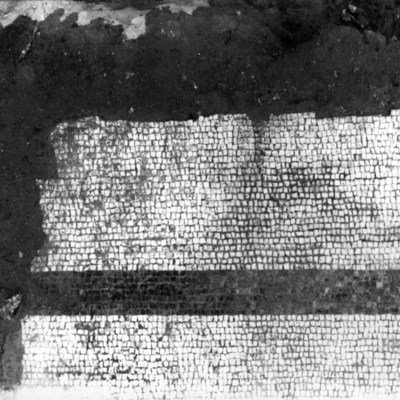 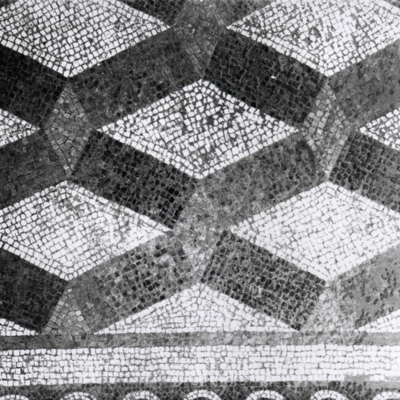 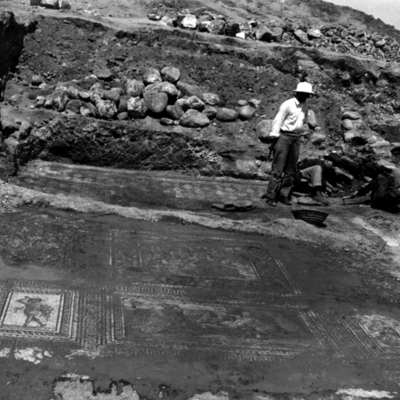 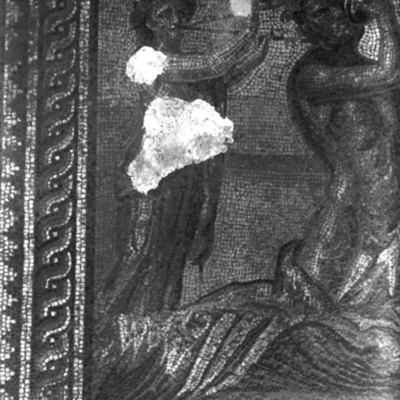 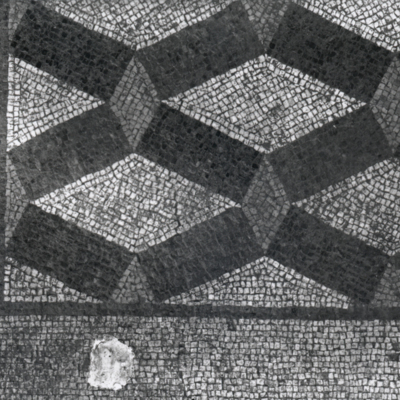 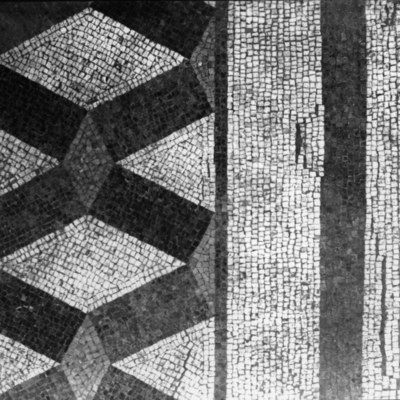 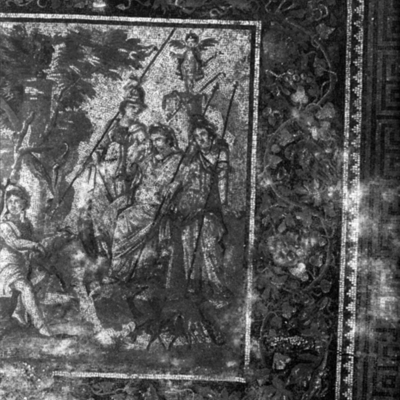 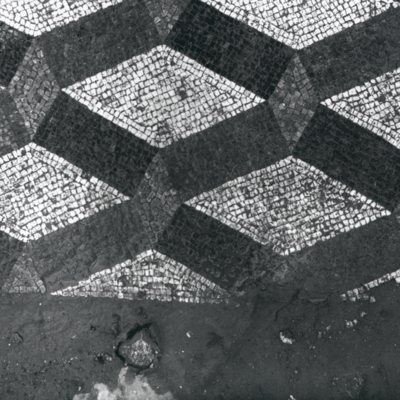 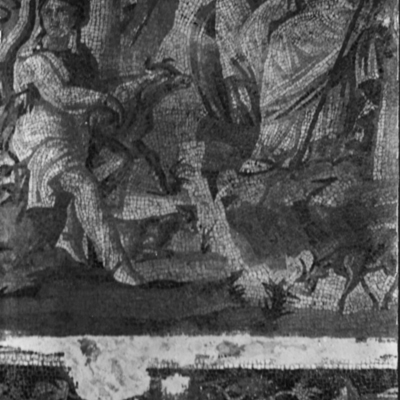 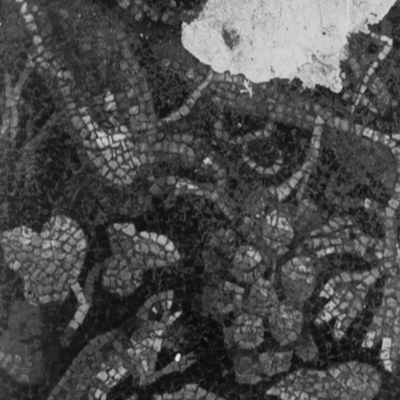 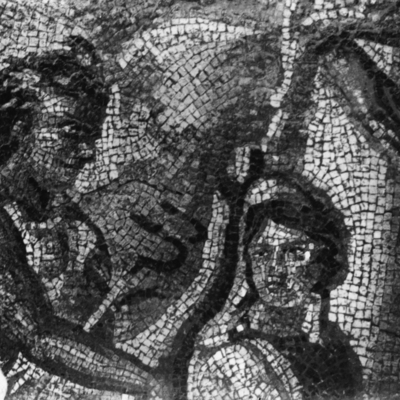 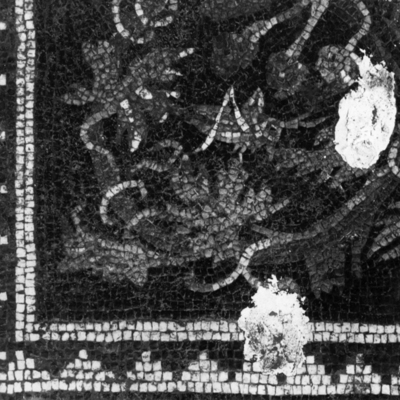 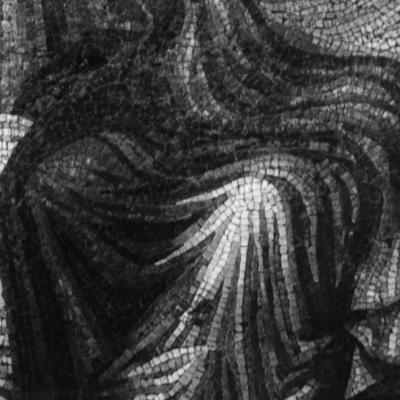 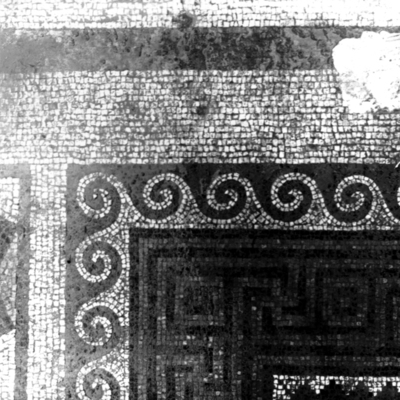 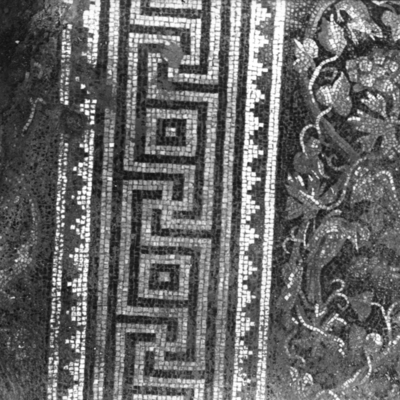 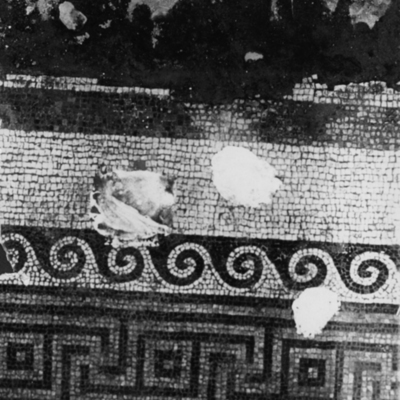 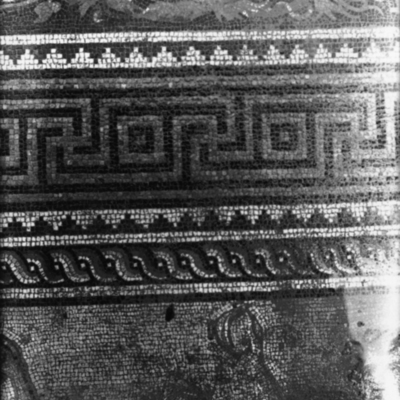 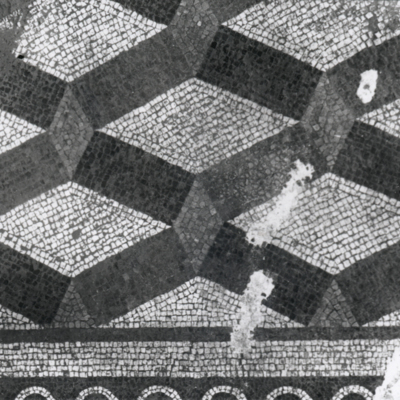 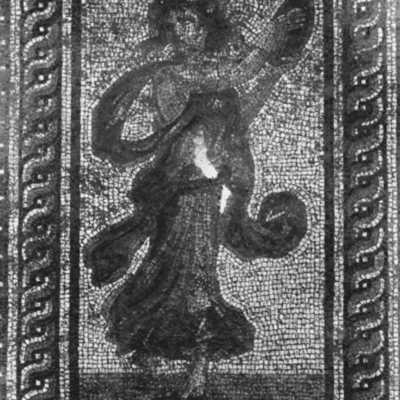 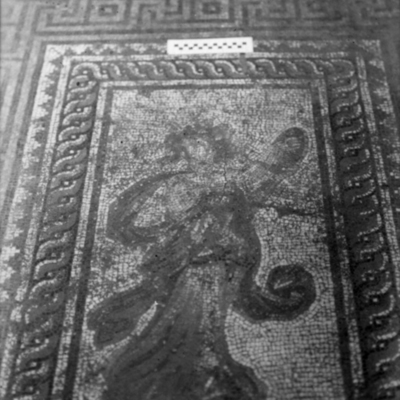 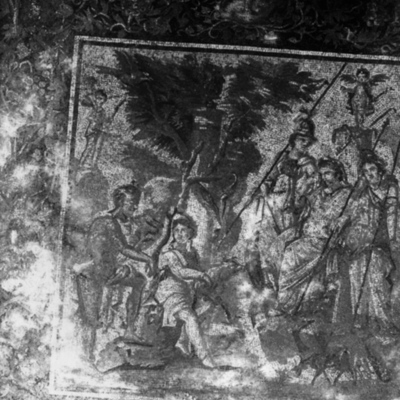 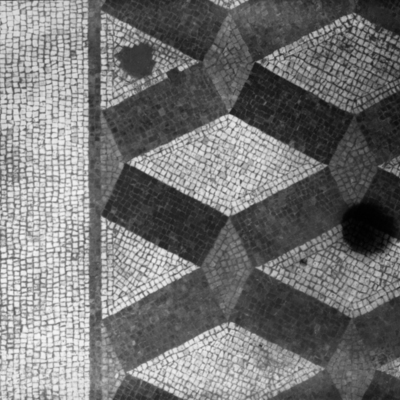 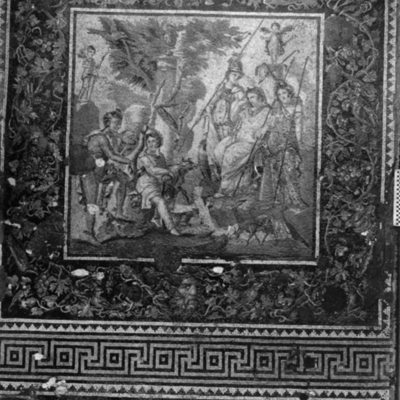 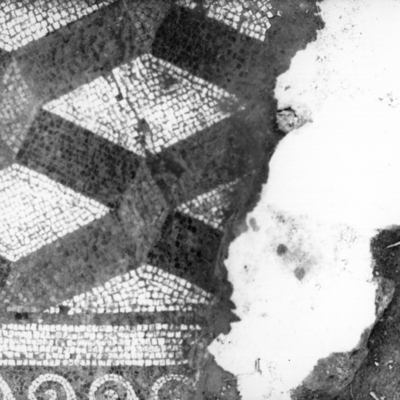 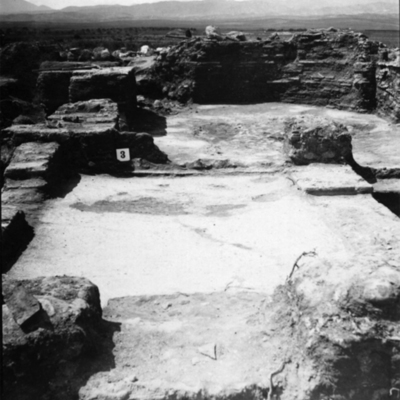 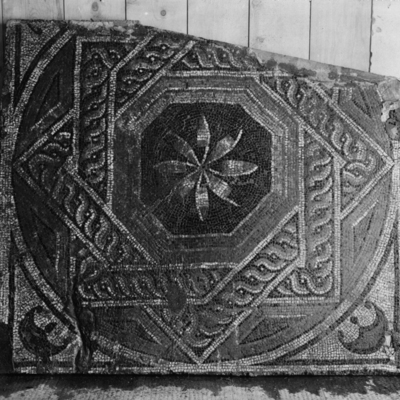 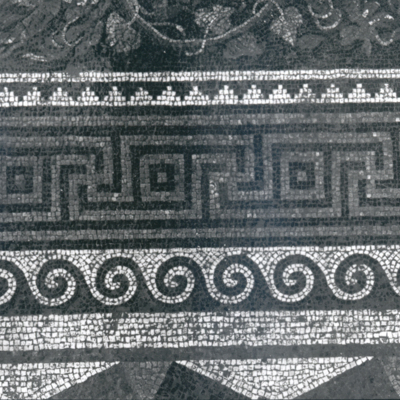 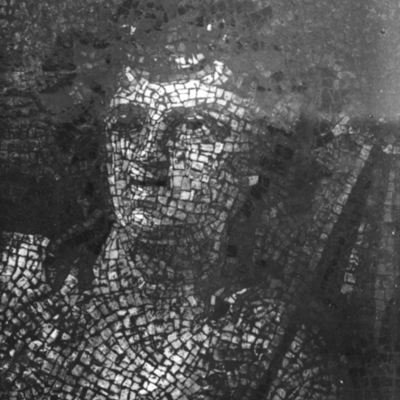 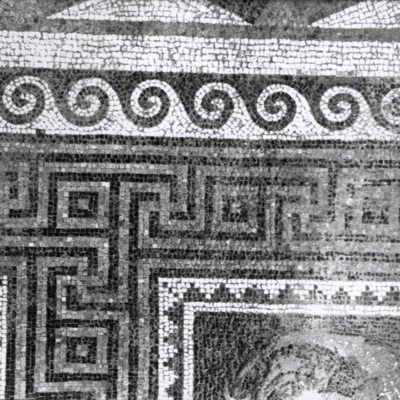 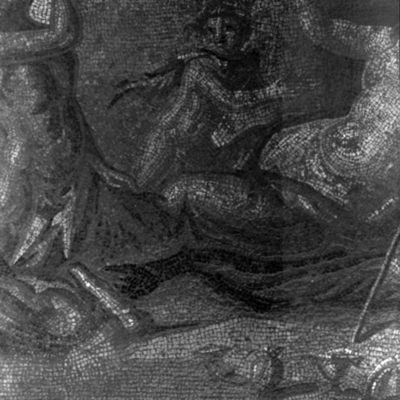 General view of pool mosaic.